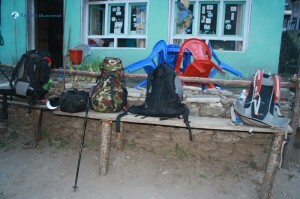 The first day was the easiest. 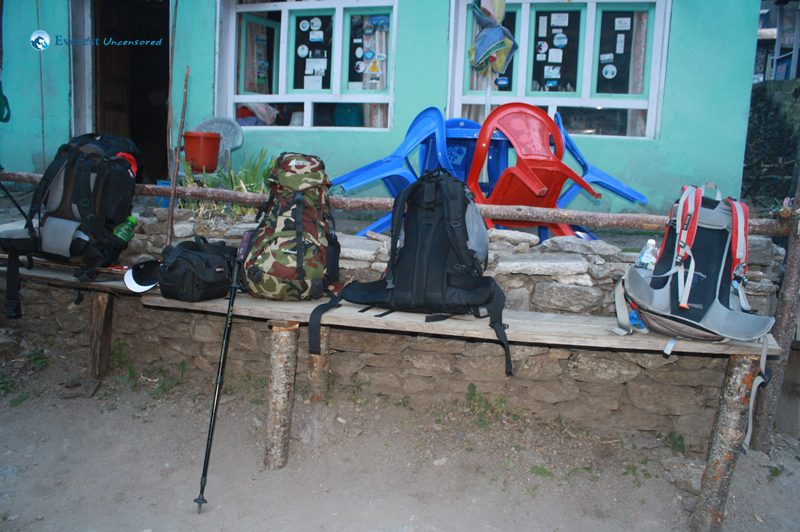 We met in Sifal at 7:00AM, distributed the snacks, supplies and medicines between our bags, and hopped in the jeep. 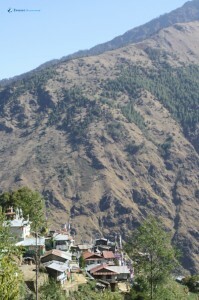 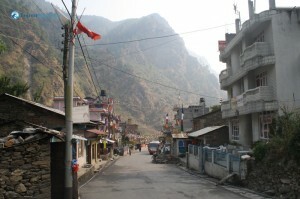 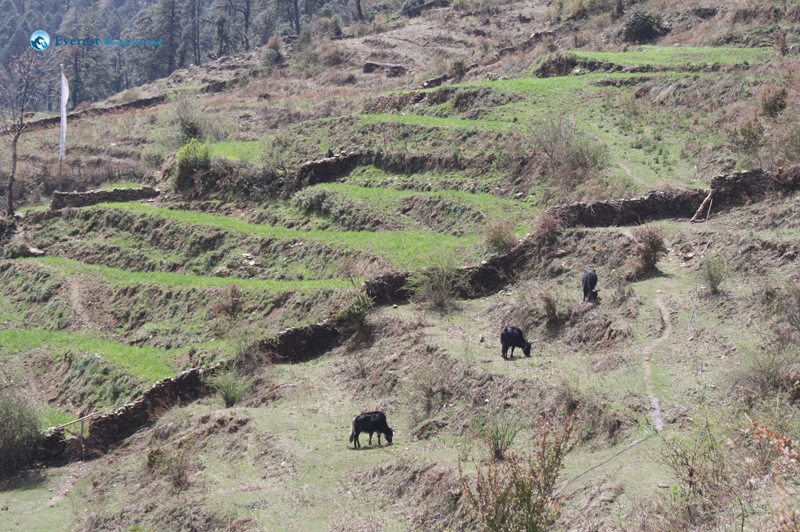 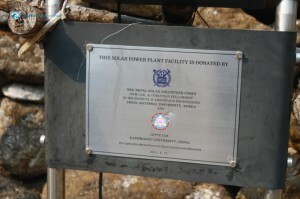 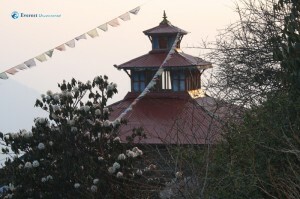 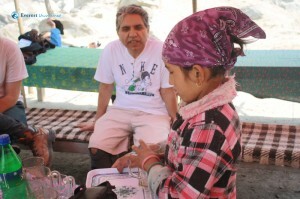 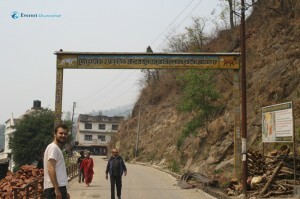 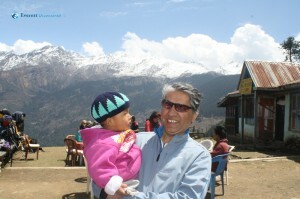 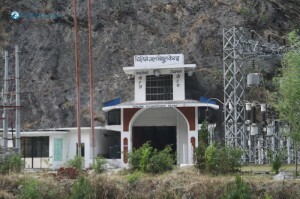 Ram took us out of the city through Thankot, across the district border and out of Kathmandu along the road to India. 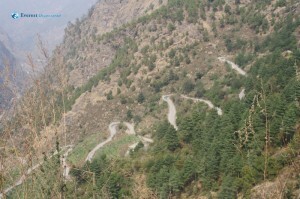 The winding road dipped slowly down to the Trisuli River Valley. The fertile red-clay soil here gives rise to innumerable flooded rice paddies and golden fields of ripe wheat, sprawling along the banks of the pale-turquoise Trisuli River. The Trisuli is a “Nadi” in Nepali, which is to say a big river, a true river, a river whose name does not require any explanation. 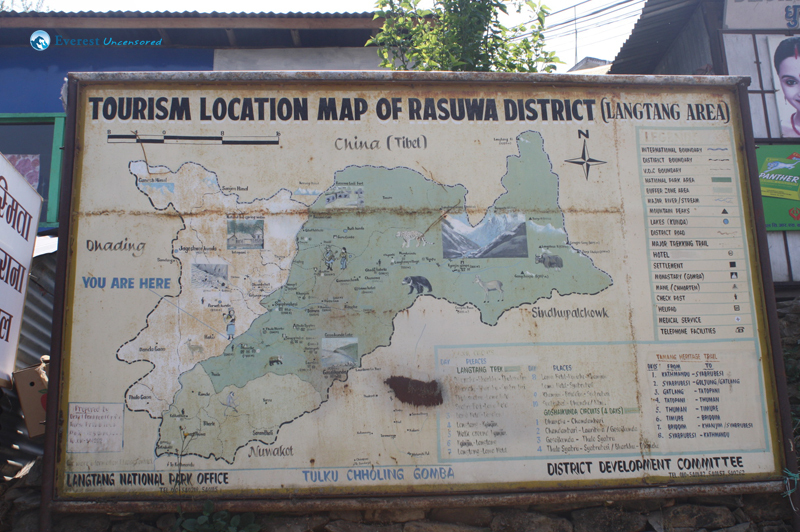 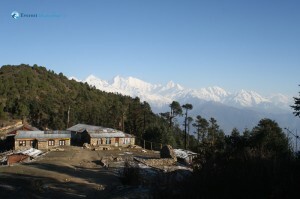 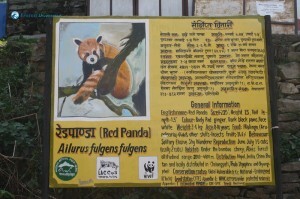 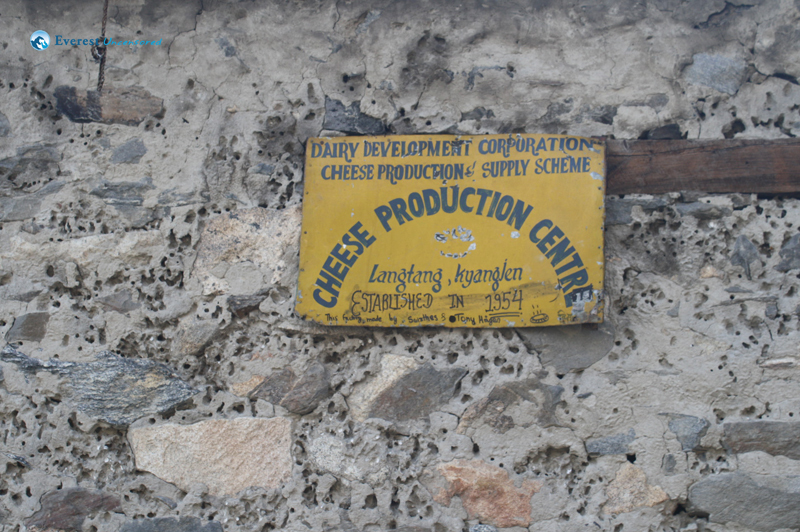 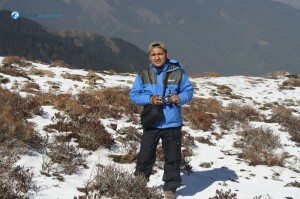 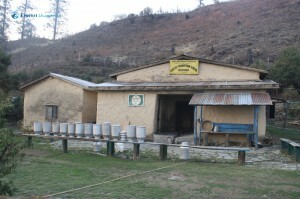 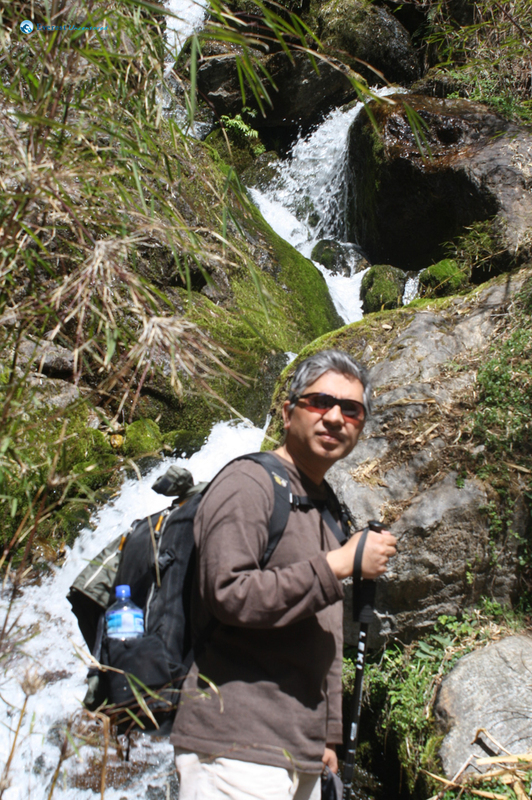 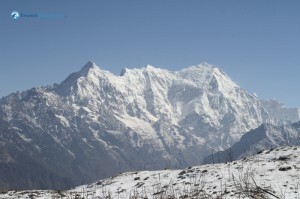 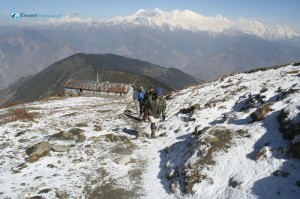 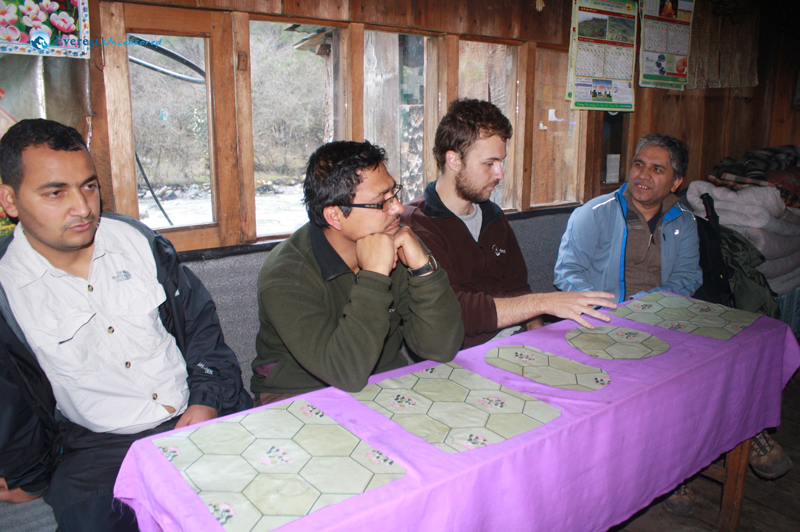 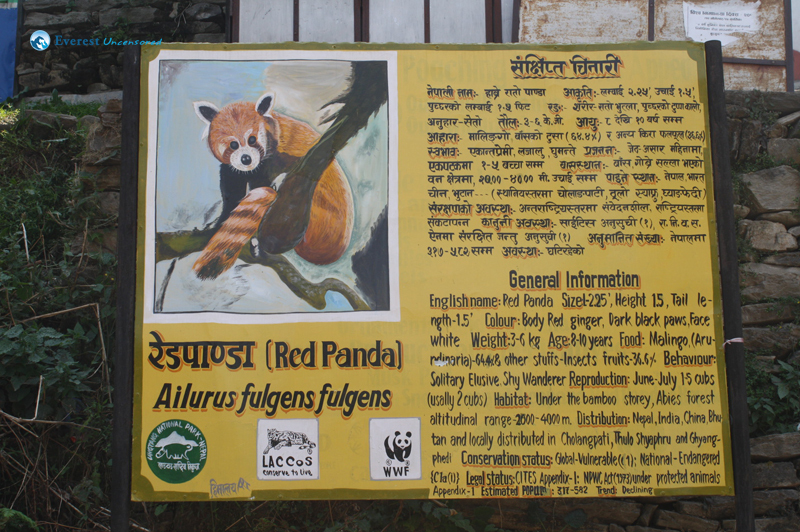 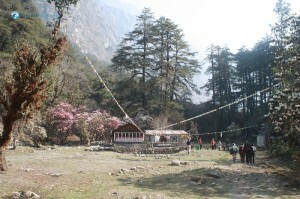 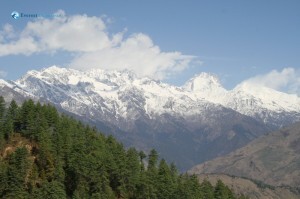 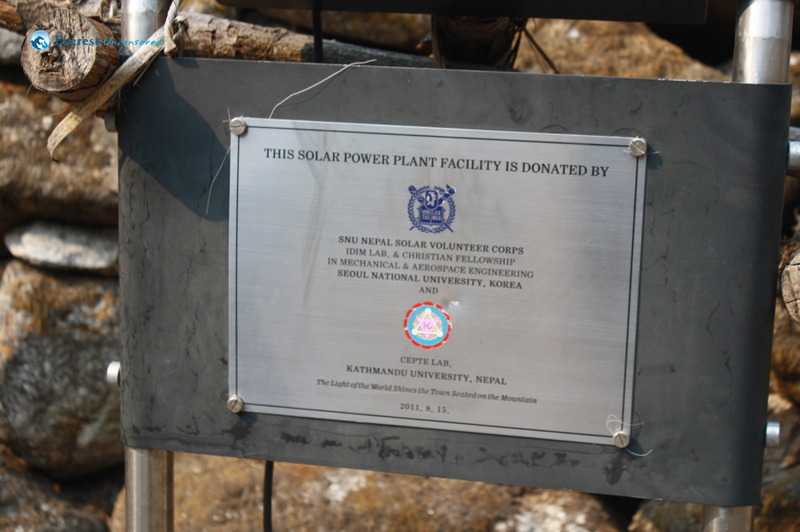 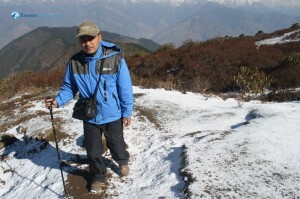 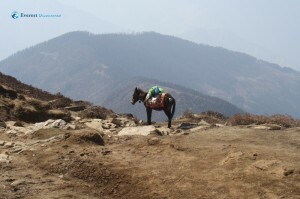 We entered Rasuwa district and, shortly afterwards, crossed into Langtang National Park. 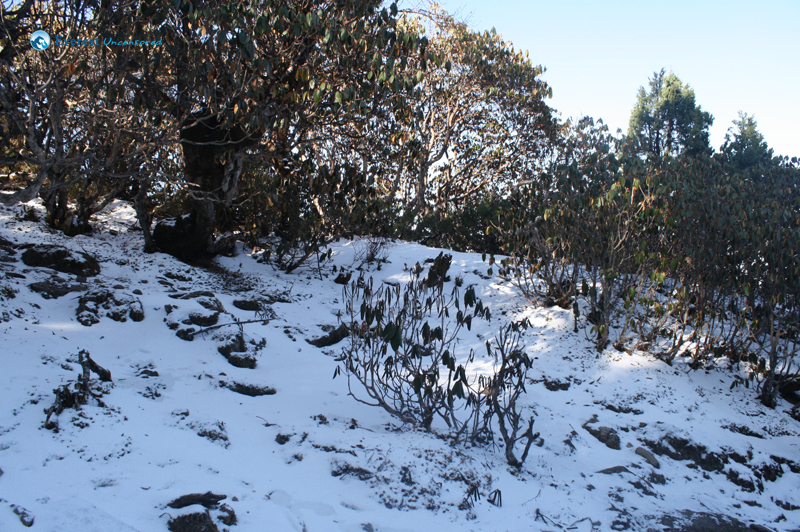 Here we started uphill again, and the road deteriorated accordingly. Landslides have taken their toll on the infrastructure here, eliminating the road entirely and leaving a makeshift path in its place, rocky and dusty and clinging like a stubborn vine to the hillside. 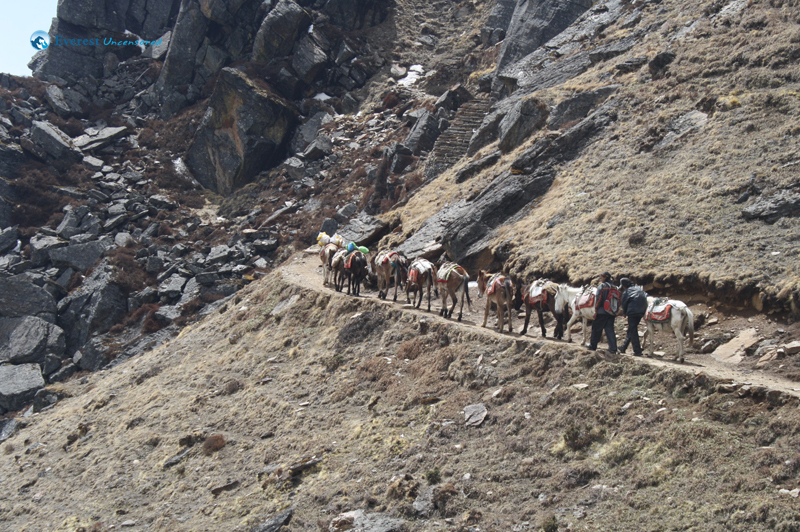 A gravel truck ahead of us blew a tire and there was no room to pass. 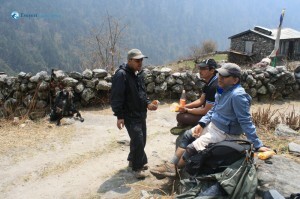 So we waited while the good-humored driver changed the flat. 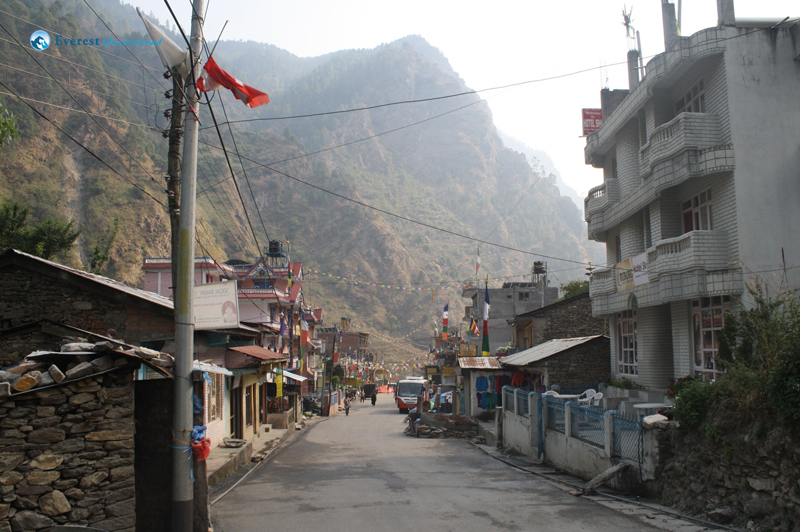 We stopped for a late lunch in Dunche (2000m), the sleepy headquarters of Rasuwa district, and from there it was a short hour’s drive to Syabrubesi, where we bid farewell to Ram, piled our things into the hotel, and made camp for the night. 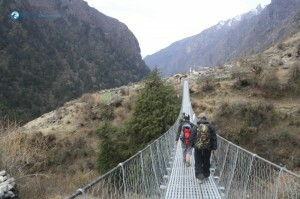 We rose early on the second day, and crossed the Bhote Koshi Nadi (Tibet River) on a narrow wire bridge. Across the river, in Old Syabrubesi, we took a quick breakfast where Rudra failed to convince an elderly Tamang man to give up chewing tobacco. 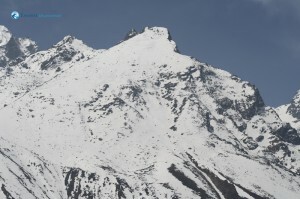 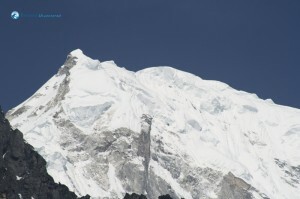 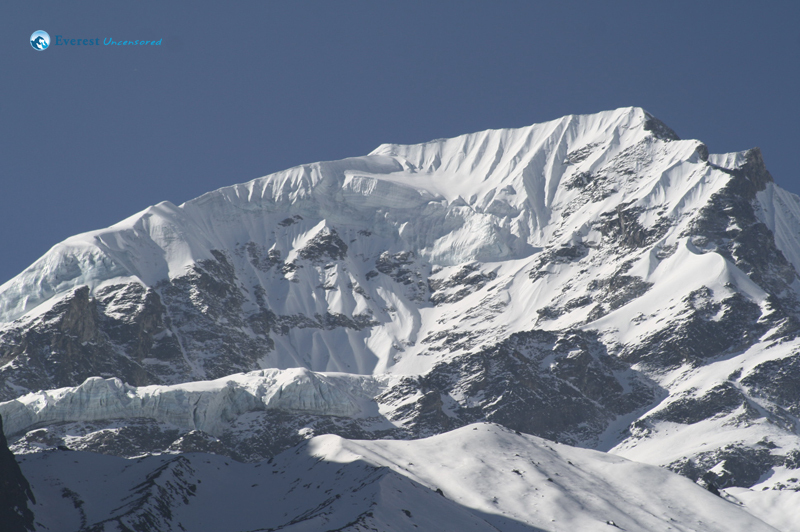 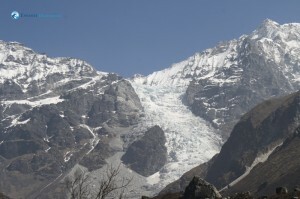 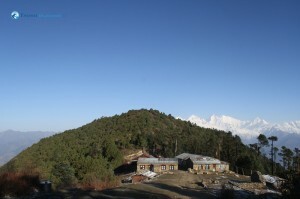 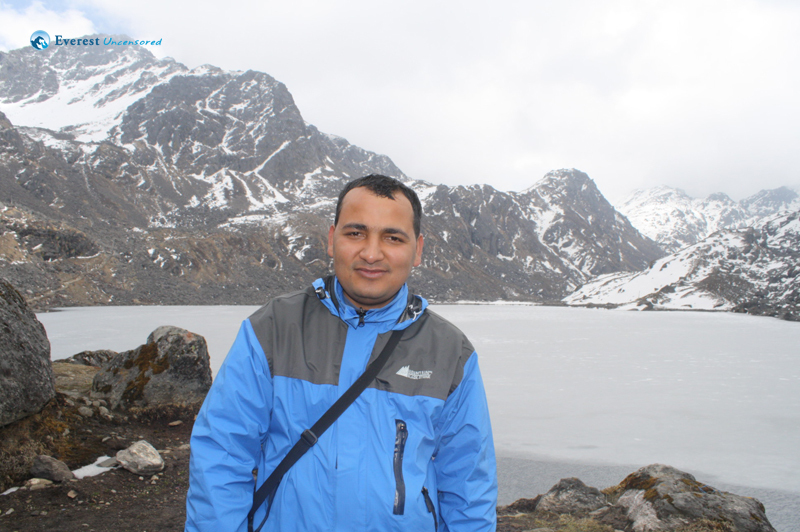 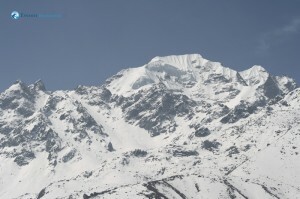 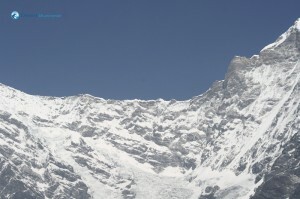 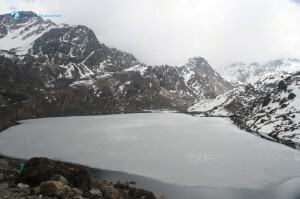 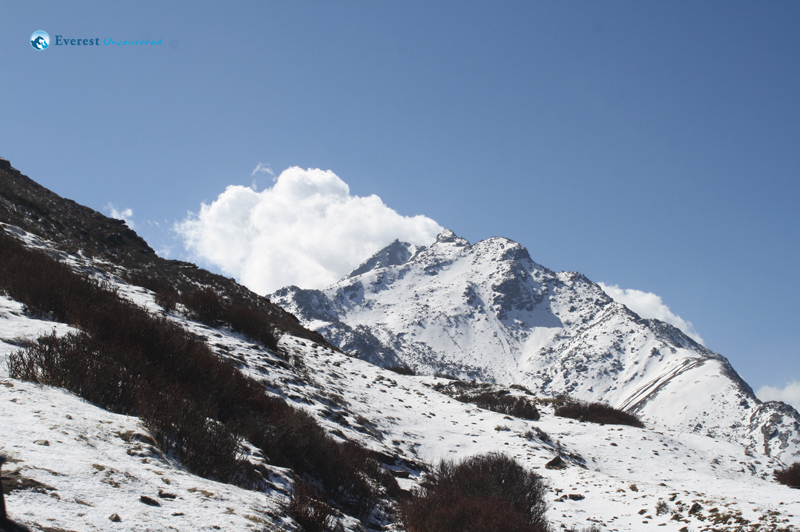 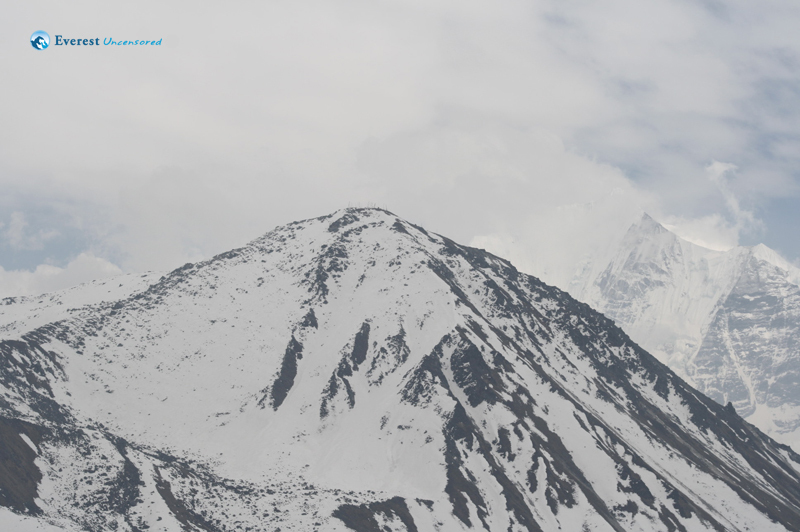 Syabrubesi is located at the intersection of the Bhote Koshi Nadi and the Langtang Khola, and from here on we would follow the latter stream up into the mountains. 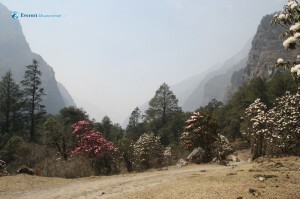 The steep cliffs keep half of the valley in the shade for most of the day and play some interesting tricks on the local vegetation. 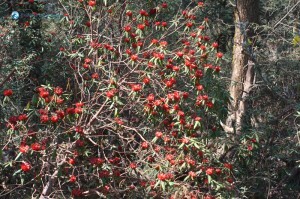 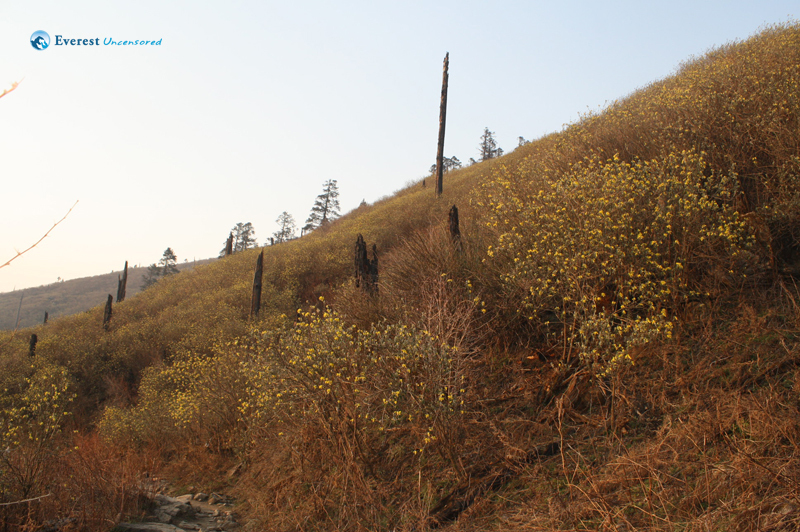 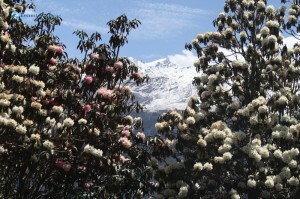 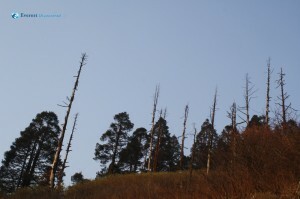 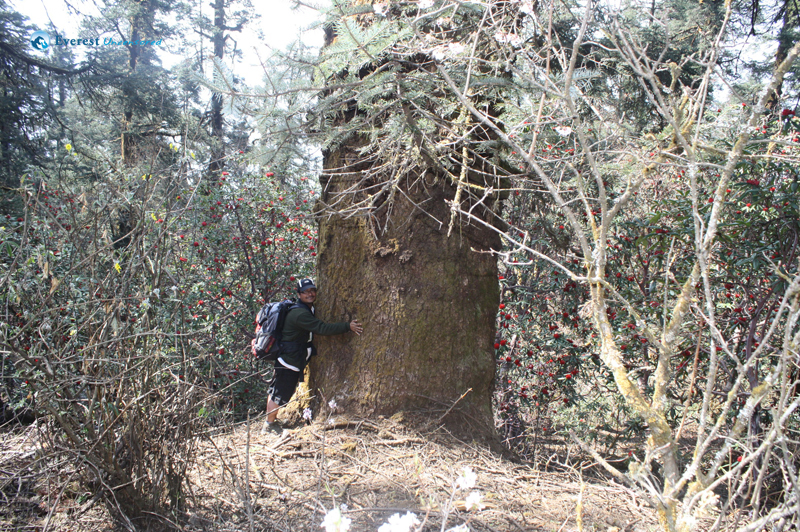 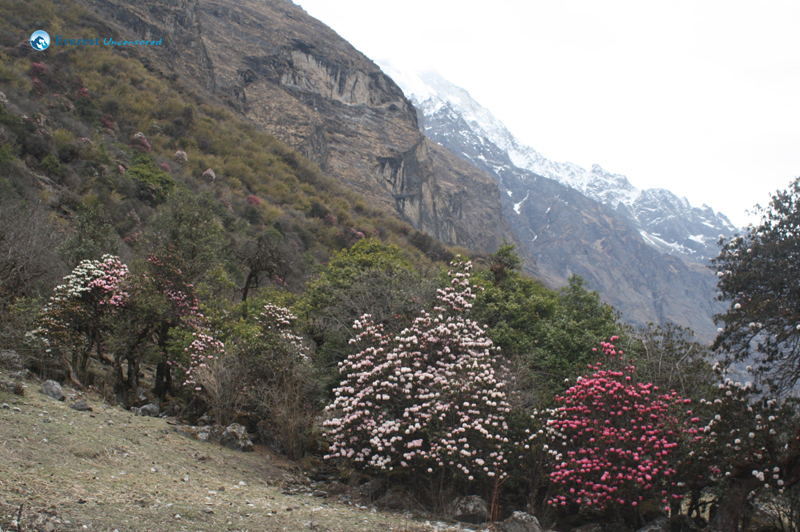 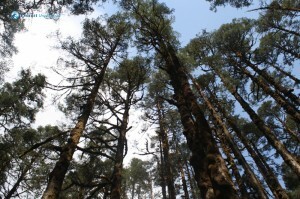 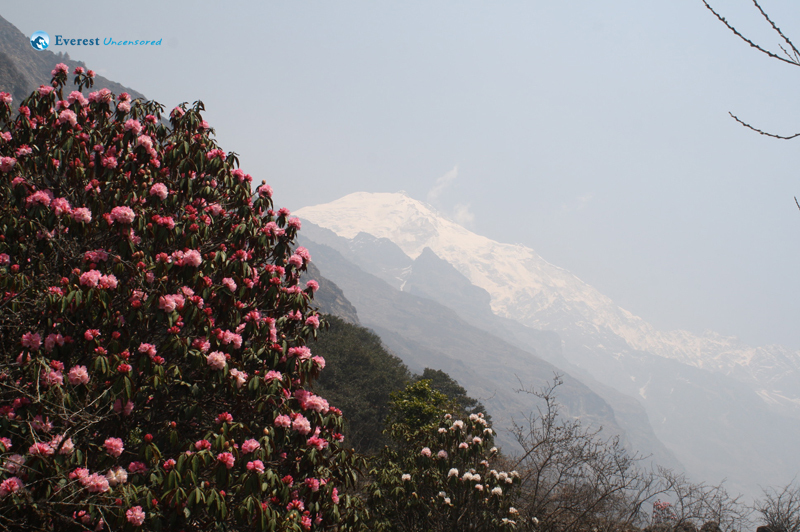 While the south slope of the valley of the Langtang Khola is swathed in dense green jungle, and shelters troops of Langur Monkeys and hidden choruses of birds, the north slope is barren, home only to scrub brush and a few hearty cacti. 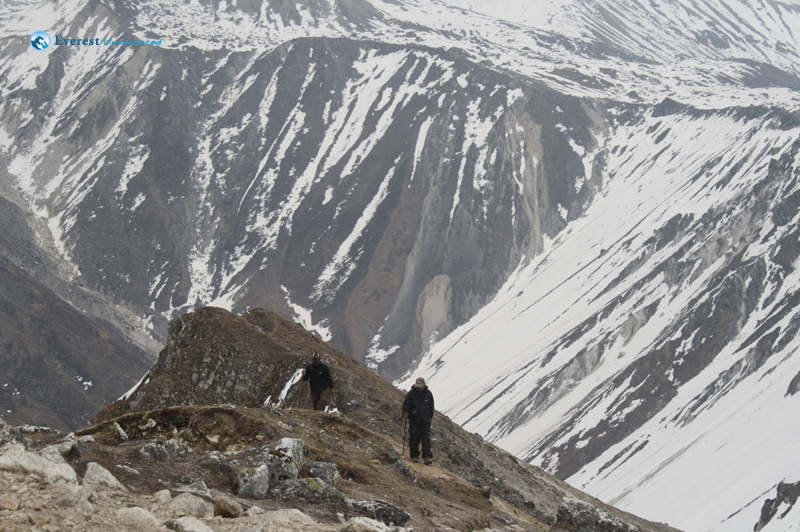 The trail, which we shared with a group of porters hauling 60 kilo loads of steel wire, followed the north slope to a tea house, whose name escapes me. There we crossed the new bridge (the old one was a few hundred meters upstream and made of logs) to the south slope and continued on in the shady comfort of the forested south slope. 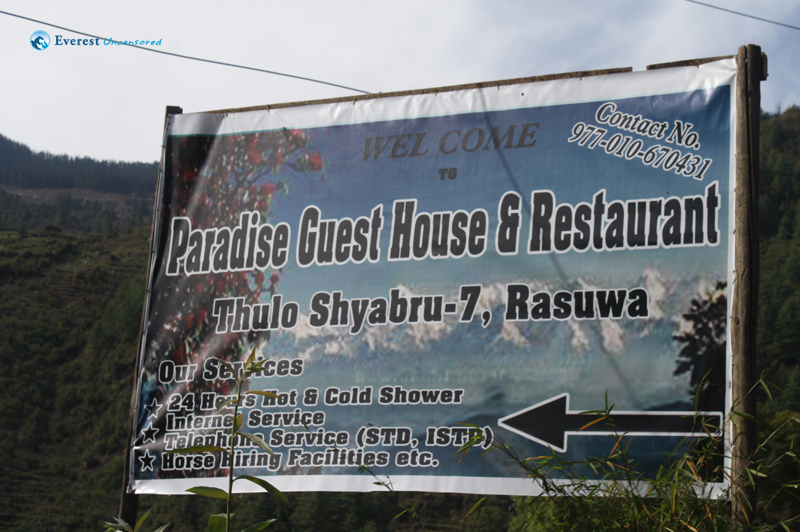 We tried some tried vegetable jerky near the waterfall at Daman, and at Pairo caught a glimpse of the soon to be infamous village of Thulo Syabru perched 500m above us. We stopped for chowmein at Bamboo, where it must be noted that there is no bamboo. Though we’d been ascending all morning, the slope of the trail had been gentle, indeed barely noticeable. That changed quickly. 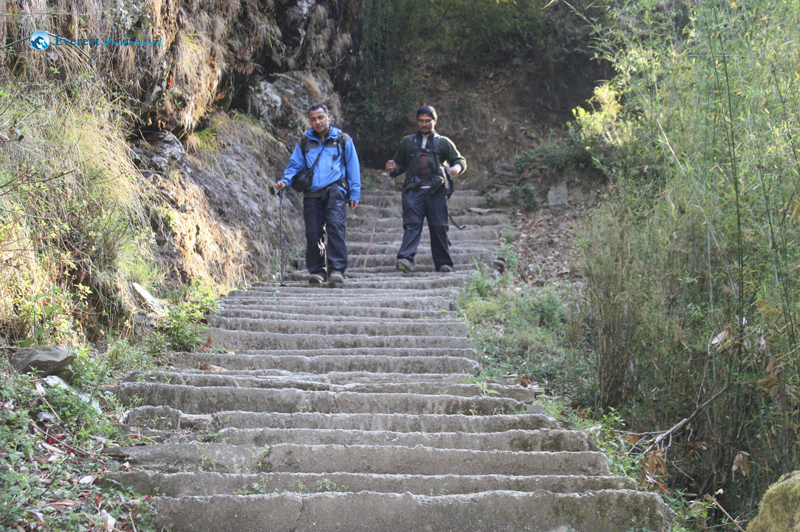 After Bamboo the trail becomes an unreasonably and uncompromisingly steep climb alongside the Khola as it plummets through a series of landslides and waterfalls, and it was on this trail that we spend our afternoon. After hours of climbing, the trail finally flattened where the low road that we had taken met the high road through Sherpa Gaon at Rimche. From there it was no more than an hour to Lama Hotel where we settled into a guest house for some less-than-appetizing daal-bhat and a night of well-earned rest. To the dismay of our hamstrings, day three started as steeply as day two had ended. 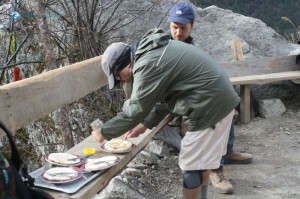 From Lama Hotel we climbed to the Riverside Lodge at Gumnachowk where we had our first taste of the pita-like Tibetan-style roti (bread) that would become our staple food for the next few days. From Gumnachowk we climbed further and further to Ghora Tabela (3000m) where at last the trail flattened out; we had reached the upper Langtang Valley, trees were becoming scarce and the intimidating snow-capped massif of Langtang Lirung, the highest peak in the area at 7227m (23,711ft), loomed above us shining brilliantly in the late morning sun. 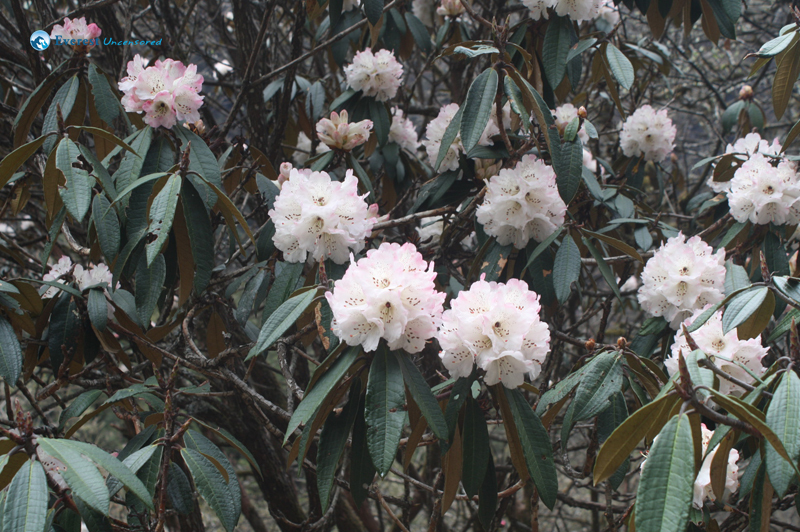 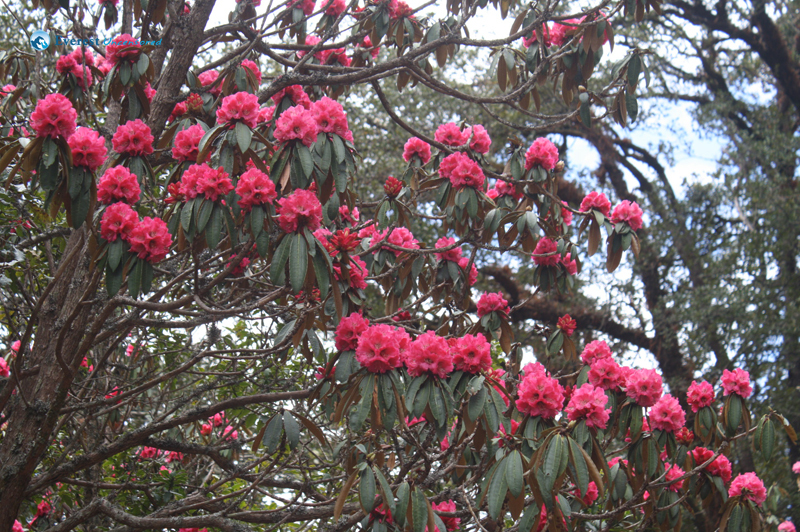 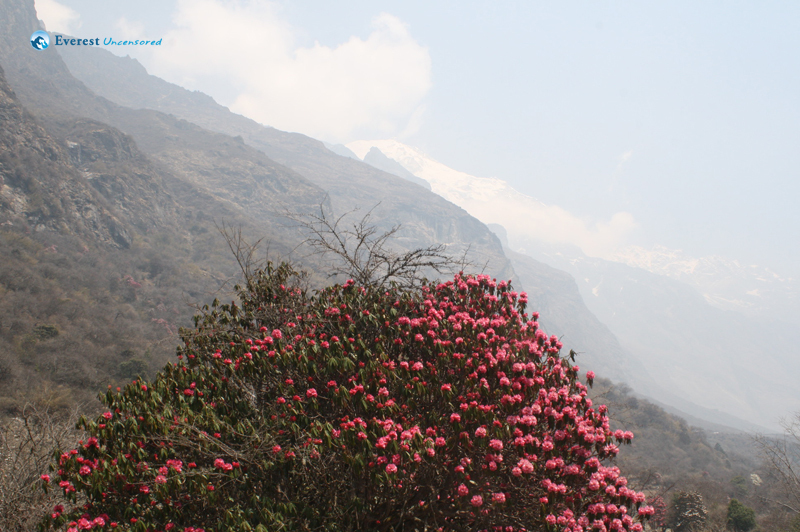 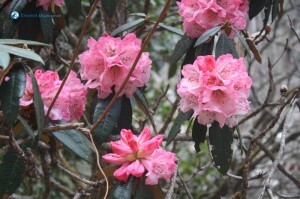 What had been jungle in the lower valley, turned to grassy meadows at Ghora Tabela, and rhododendrons burst into bloom in bright red, pink and white. 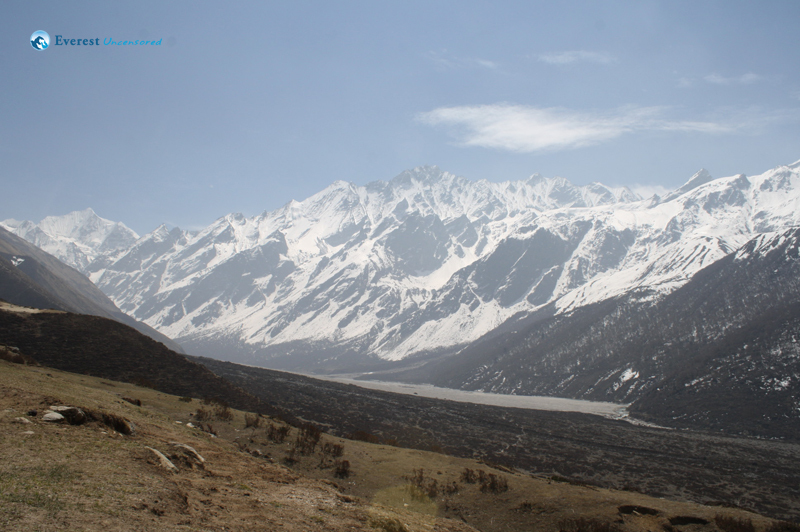 We were in the glacial part of the valley now, much wider and more level than the narrow river valley below, and a leisurely walk through yak, nak and horse pastures left plenty of time to admire the soaring mountains to our left and right. 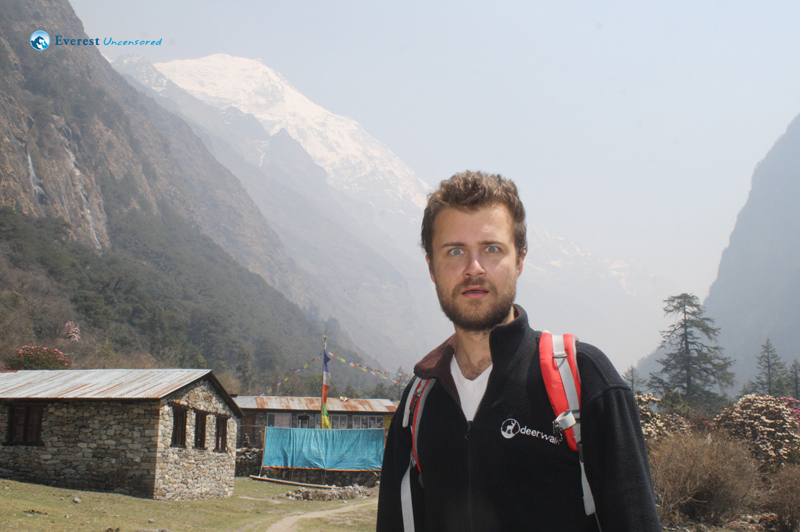 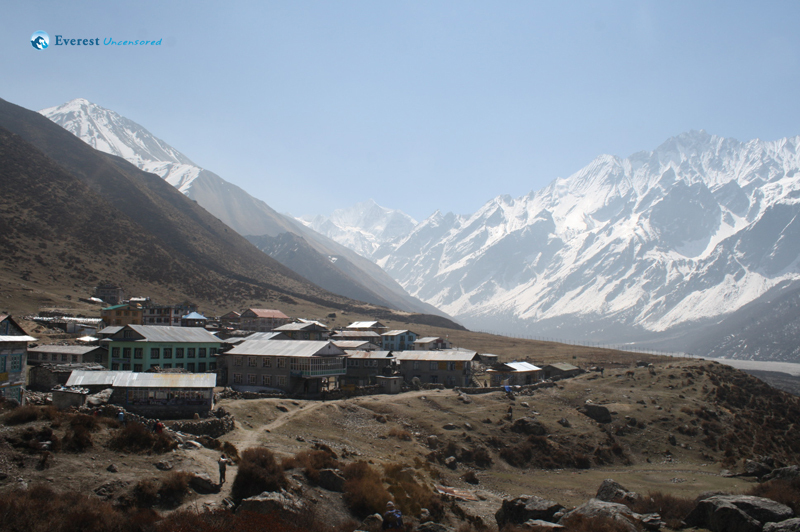 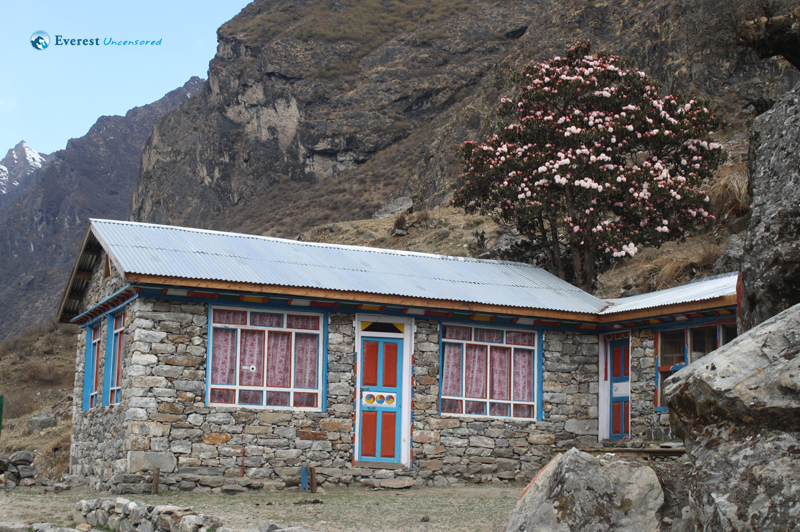 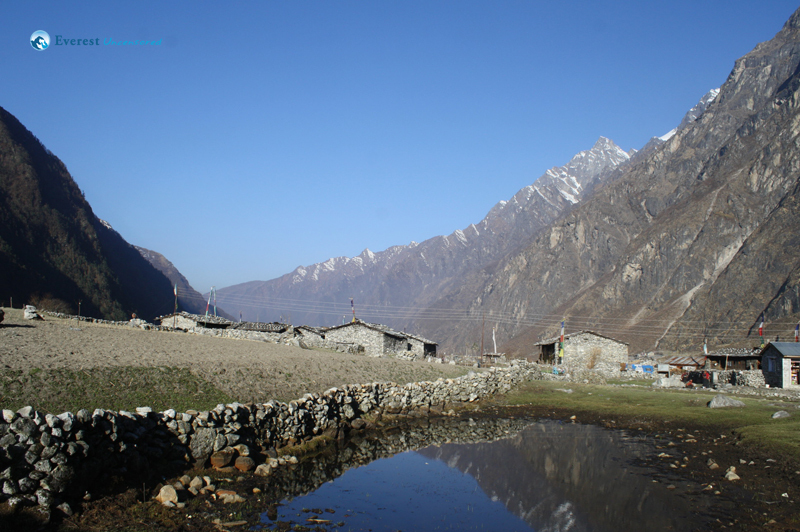 In a few hours we had reached Langtang Village, at the foot of Langtang Lirung, where we selected our guest house and turned in for the night. 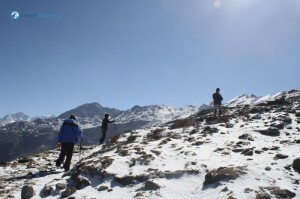 Altitude troubles brought about a change of plan at the start of day four. 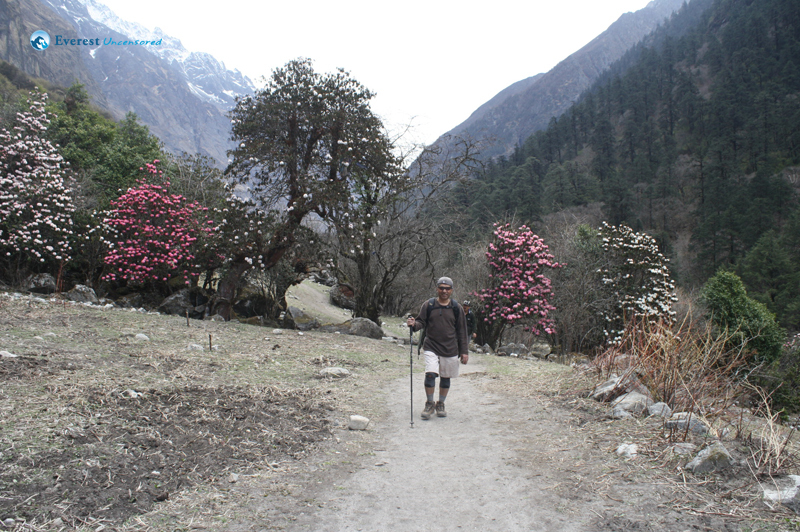 The standard trekking route through Langtang makes day for an easy one, with a quick morning walk from Langtang Village to Kyanjin Gompa being the only major travel of the day. 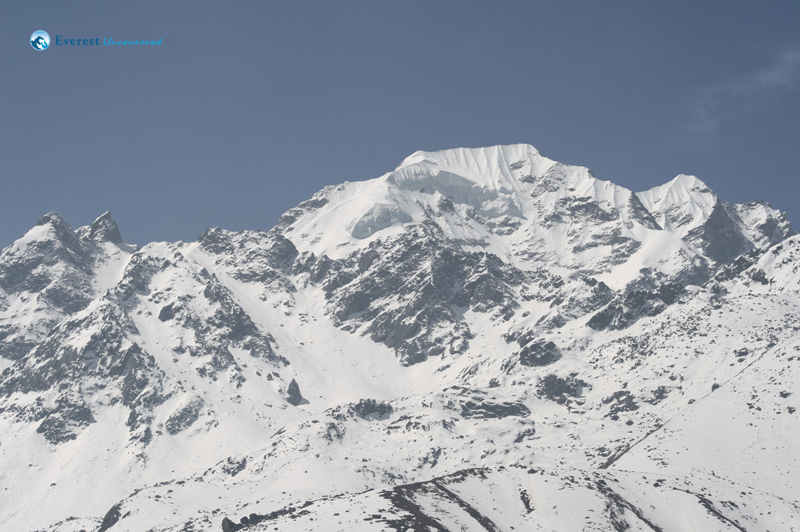 In theory this leaves the afternoon for exploring the high altitude (3800+m) environment of Kyanjin Gompa at ones leisure. 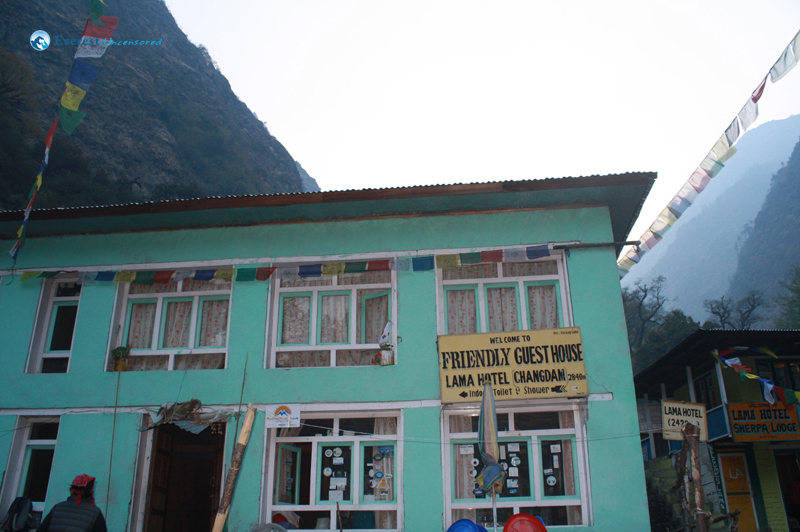 But with altitude already taking its toll on some of us, we deemed spending the night in Kyanjin Gompa unwise. 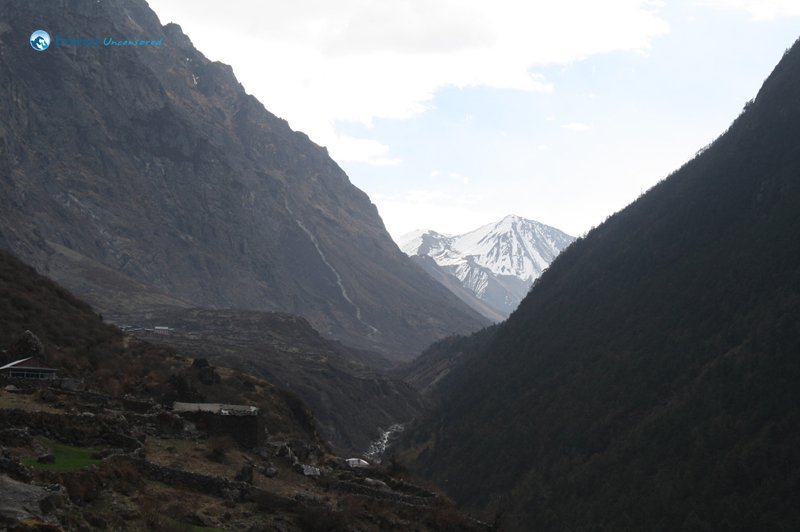 So we decided to make a day trip out of it; reaching Kyanjin Gompa as early as possible would leave us time to climb and descend Kyanjin Ri, a near-by peak, before returning to Langtang that village at night—hopefully before darkness made the trails unsafe. 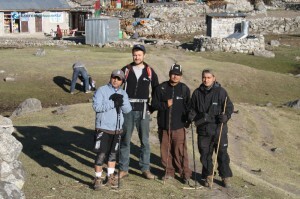 It was an ambitious plan, but it started off well. 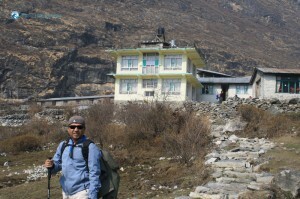 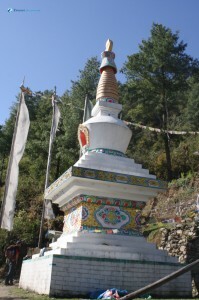 I reached Kyanjin Gompa by 9:00AM, with the others following shortly thereafter. 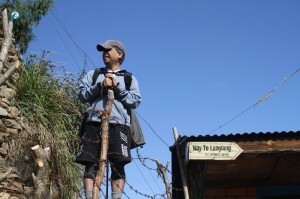 I took breakfast in the yard of a guesthouse and asked the proprietor how long it would take to reach Kyanjin Ri. 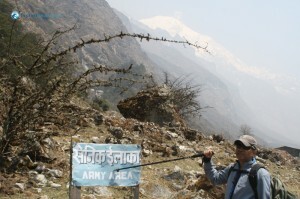 The answer—1 hour up, 1 hour down—was encouraging, but also deceptive. 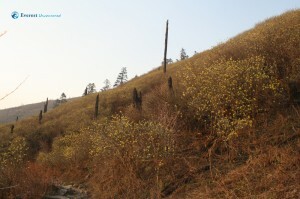 As I found out later, locally at least, Kyanjin Ri refers to a whole series of peaks along a ridge. 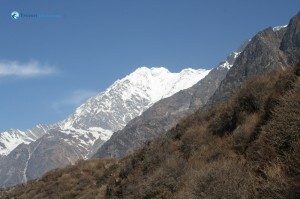 It is possible that the first of these peaks could be reached within an hour’s walk of the village, but the one we intended to climb was significantly further on. 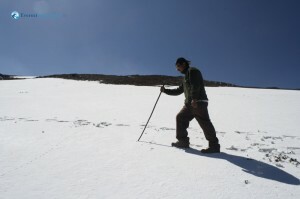 We set off for the summit at eleven, with no knowledge of how wrong the 2-hour estimate was. 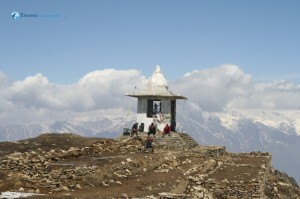 It took nearly three hours to reach the top, but it was worth it for the view and the sense of accomplishment. 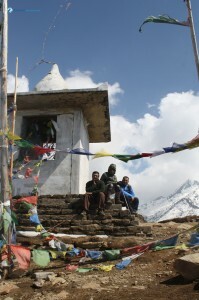 At a little over 4700m, Kyanjin Ri is by no means one of the world’s great peaks, but to actualize the metaphor and literally climb a mountain, to find gravestones on the summit there among the wind-worn prayer flags, and to look around yourself 360 degrees while seeing nothing but glacier and Himalayan snow makes the accomplishment seem quite grand indeed. 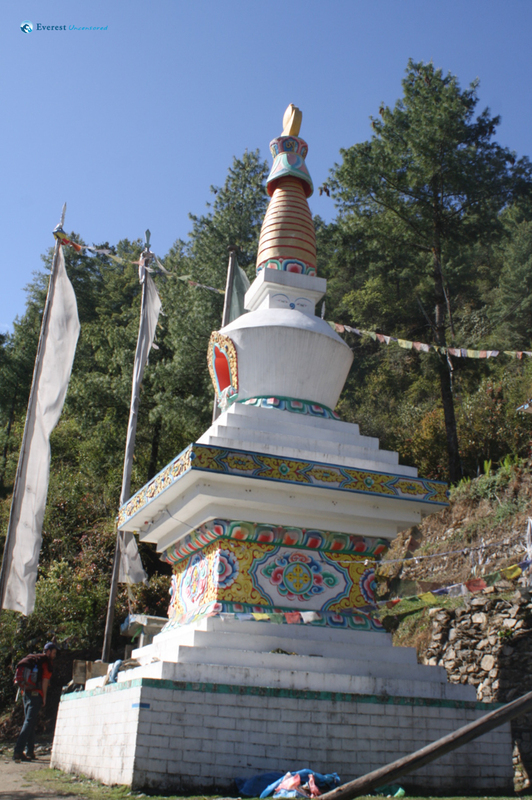 I threw up my arms in triumph when I reached the top. There was no one in sight, just me and the mountain—and I suspect I intended my gesture as a celebration for the both of us. 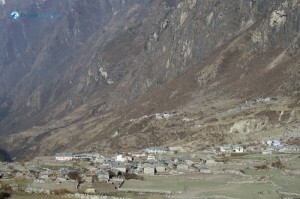 By the time we returned to Kyanjin Gompa after our descent it was past four, and already time to head back to Langtang. 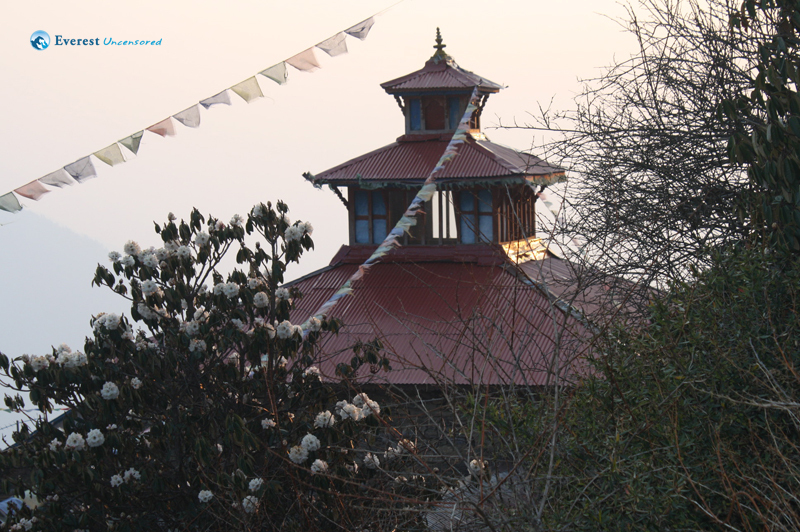 There is a part of me that would have liked to spend the night in Kyanjin Gompa, that would have liked to rise in the morning and look up through the clear morning air to the site of my little triumph, that would have liked to linger a bit and bask in the glow of a well-met challenge. It was after all, the first real mountain I have ever climbed. 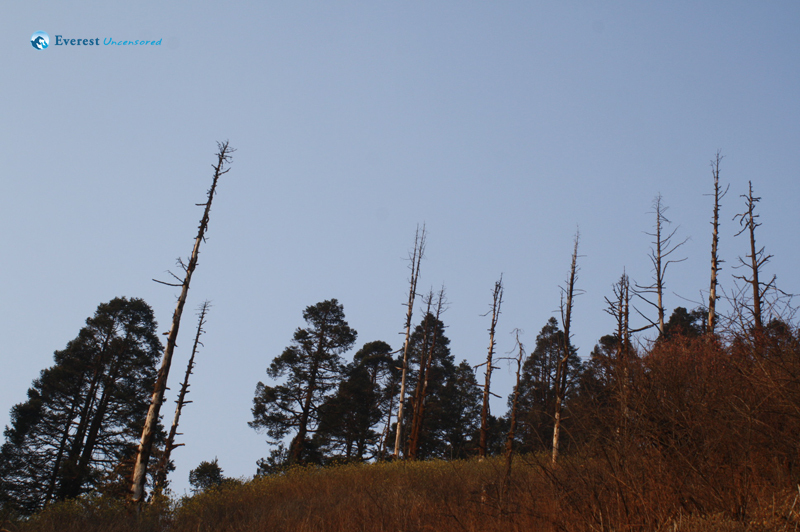 But it was not to be. 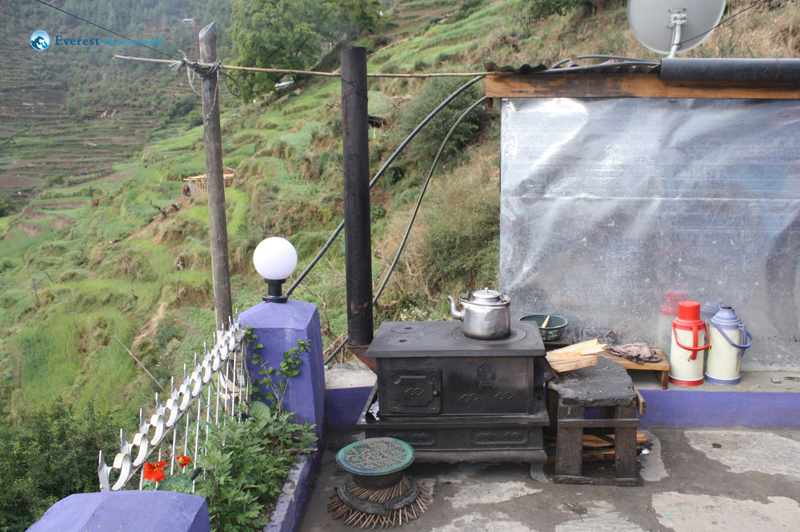 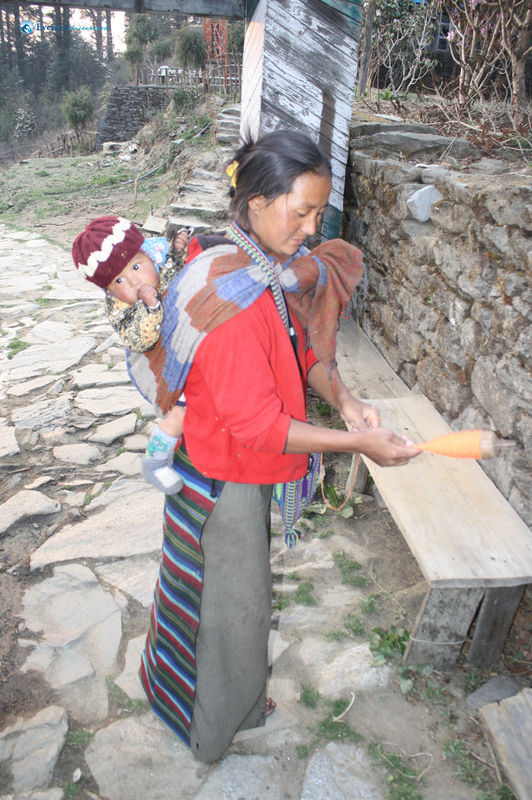 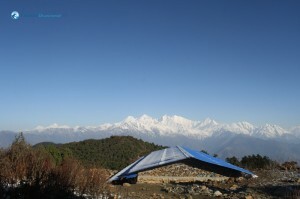 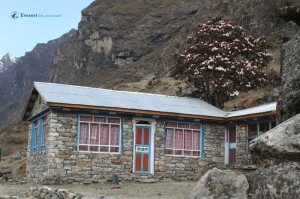 Our beds were miles away in Langtang, night was falling, and the trail beckoned. 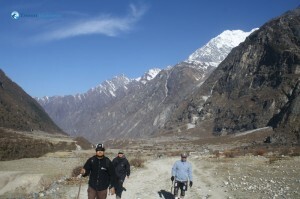 Day 5 took us from Langtang to Thulo Syabru. 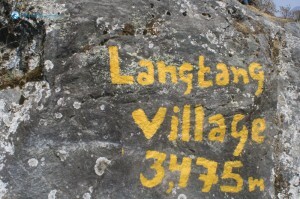 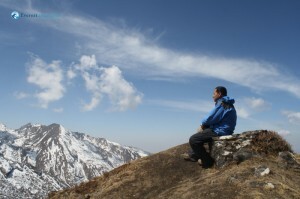 Most treks to Langtang make this trek in two days, we did it in one. 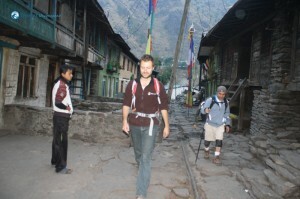 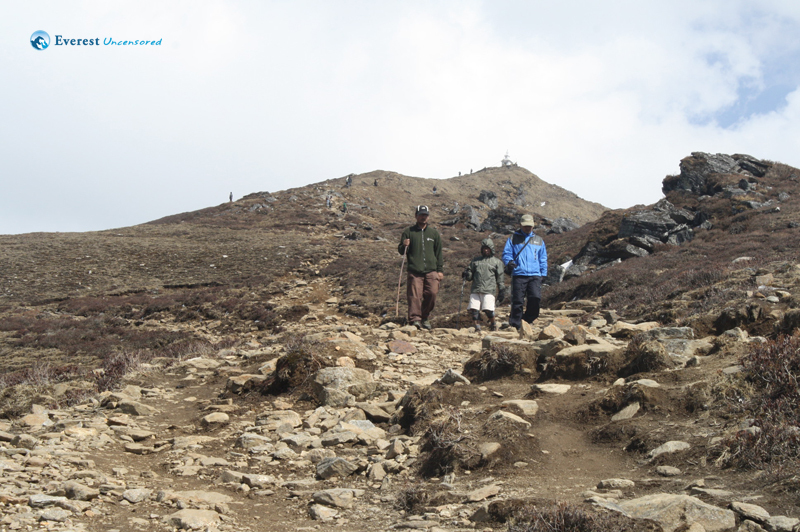 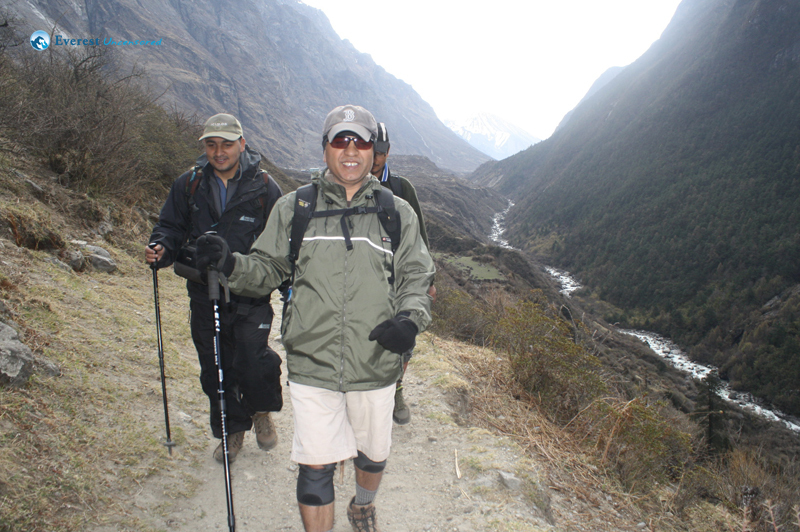 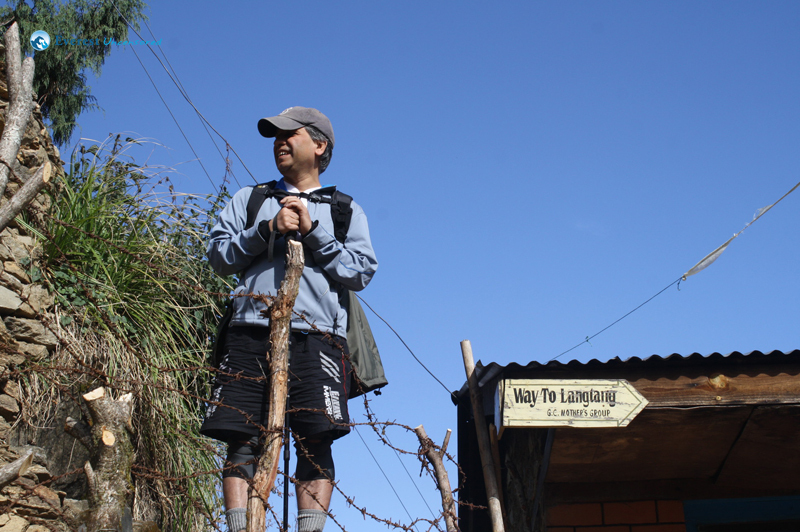 From 7AM to 4PM we retraced our steps downhill from Langtang Village to Pairo. 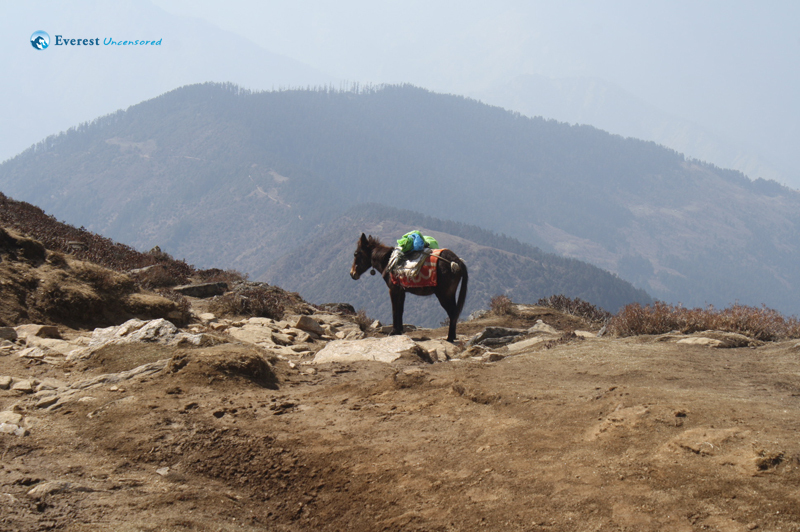 There, in the late afternoon, with rainclouds gathering, we steeled ourselves for the last leg of the journey: the 800m ascent to Thulo Syabru. 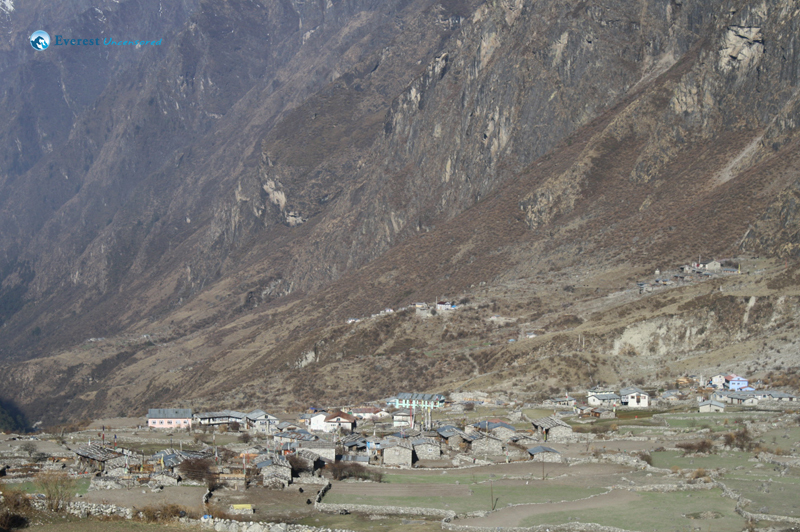 You will remember from my account of Day 2 that this particular village was clearly visible from Pairo; so close…and yet so far. 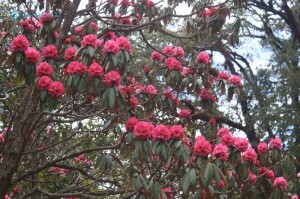 It began to rain. 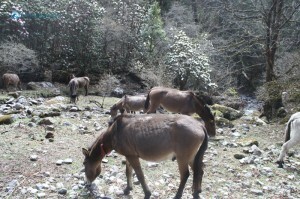 A herd of goats concealed somewhere in the forest cried out in terror when the thunder clapped. I was not so vocal, but I understood where they were coming from. 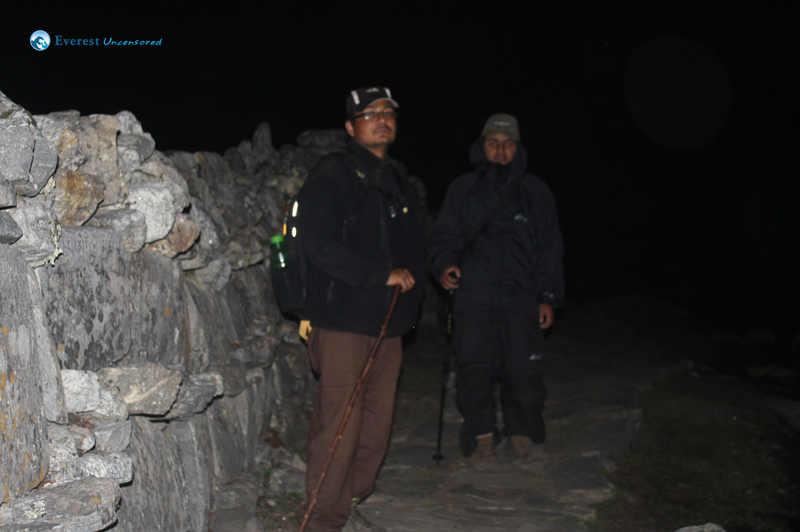 It was getting dark and we were very tired already, the rain was beginning to make the steep path treacherous, and we didn’t know the way. I do not believe it is an exaggeration to say that it was a dangerous situation. 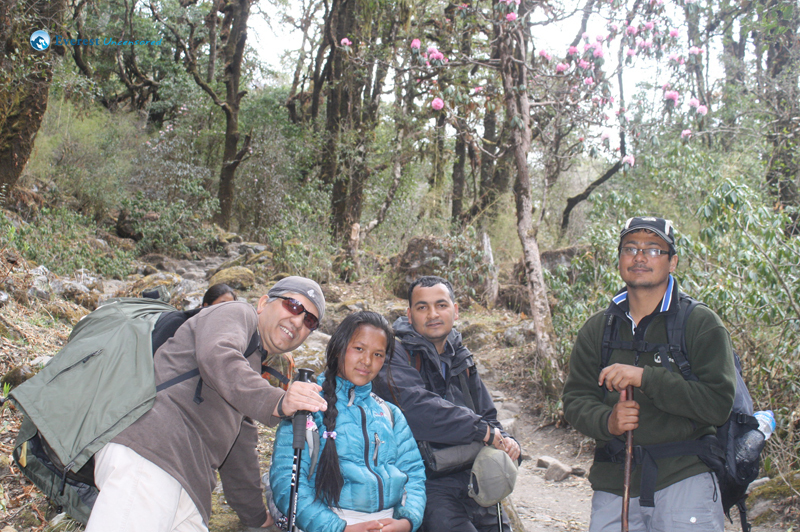 With a little less courage or a little more time we might have easily spent the night at Pairo and waited for better weather in the morning to reach Thulo Syabru. 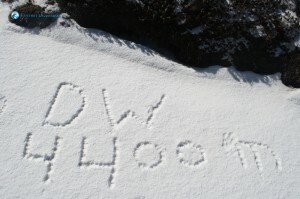 But we didn’t. 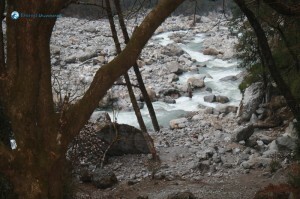 We pressed on into the gathering darkness and the cold rain. 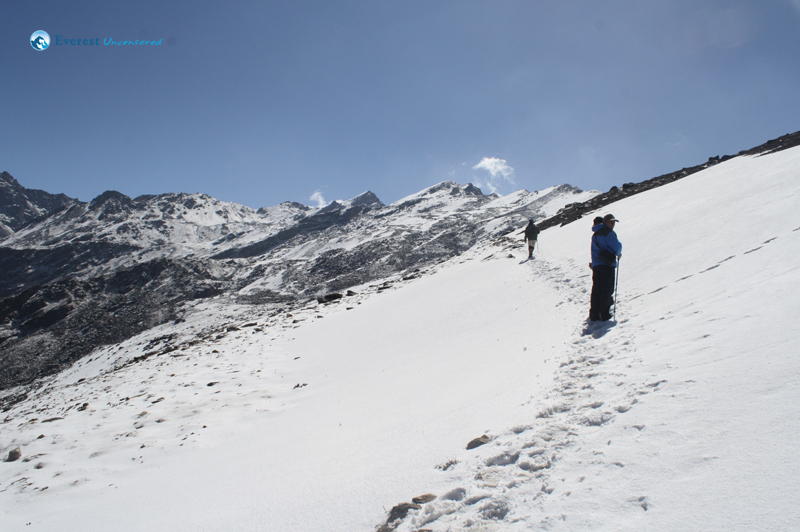 The path was steep and lonely; it seemed that even the porters refused to travel in this kind of weather. 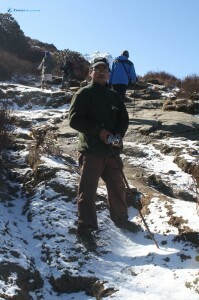 It was not a pleasant walk. 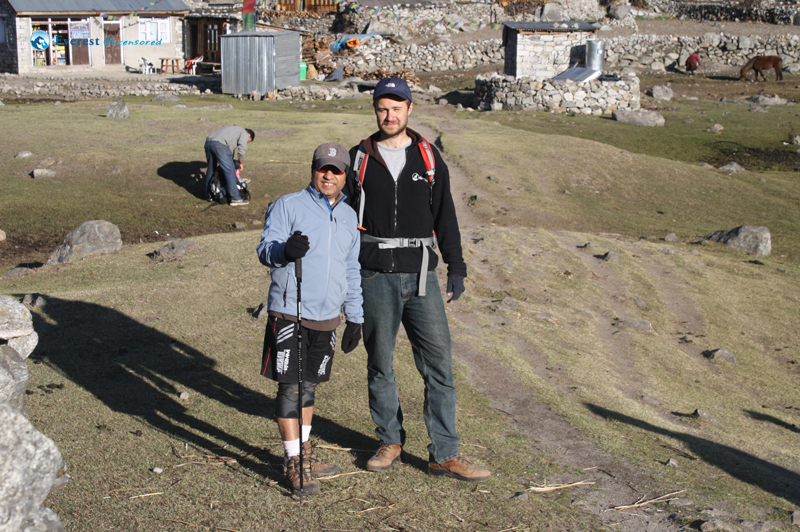 Our clothes and bags were soaked and there was mud everywhere. After an hour and a half of climbing we reached a ridge. 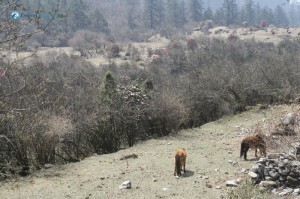 We heard voices, children, animals: “this must be Thulo Syabru”, I thought—“it must be”. But it wasn’t. 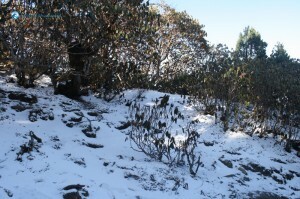 It was just a lonely tea-house. 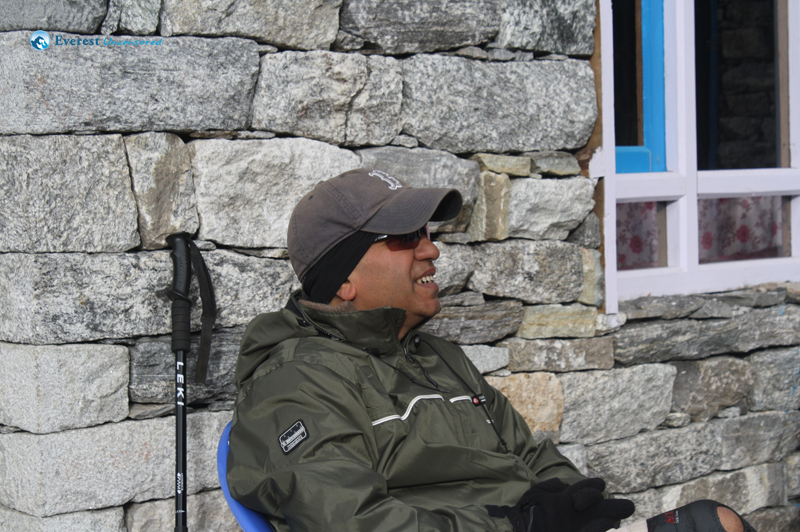 In fact, Thulo Syabru was still at least an hour away, and the rain showed no signs of abating. 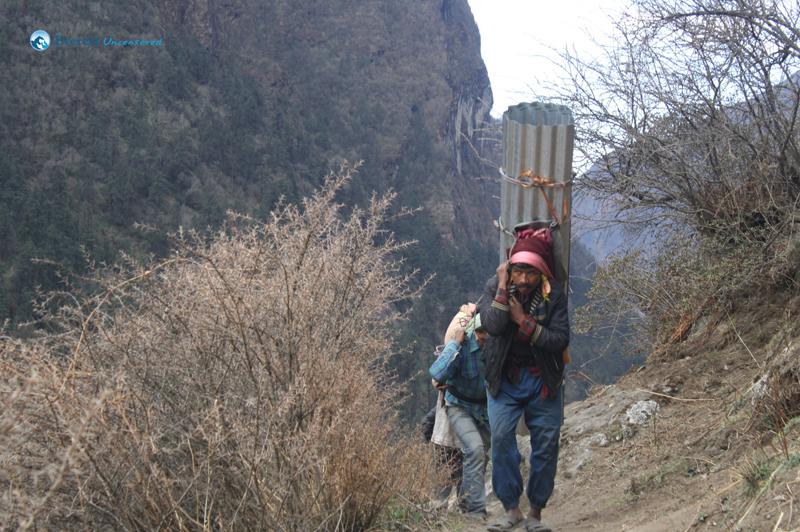 After we returned to Kathmandu I did a bit of research and learned that the path we took from Pairo and Thulo Syabru (a relatively new path constructed by whatever branch of the Government of Nepal is responsible for “rural path construction”) is not favored by local guides. 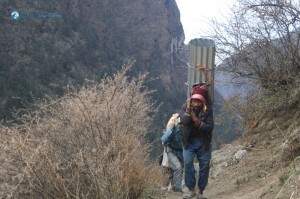 There is a very good reason for this, namely that this particular path was designed by a full-blown idiot. 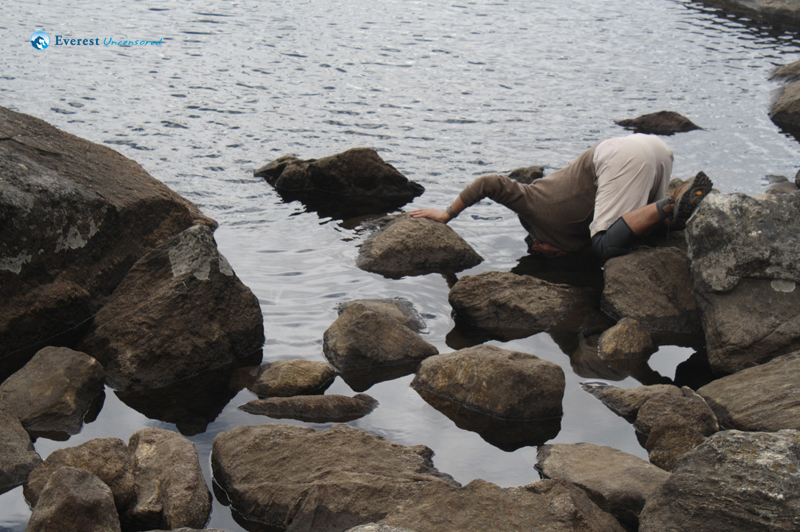 There is simply no other possible explanation. From the teahouse, still a good 500m below Thulo Syabru, mind you, the path descends—yes, de-scends—to a tiny bridge at the bottom of a gorge. 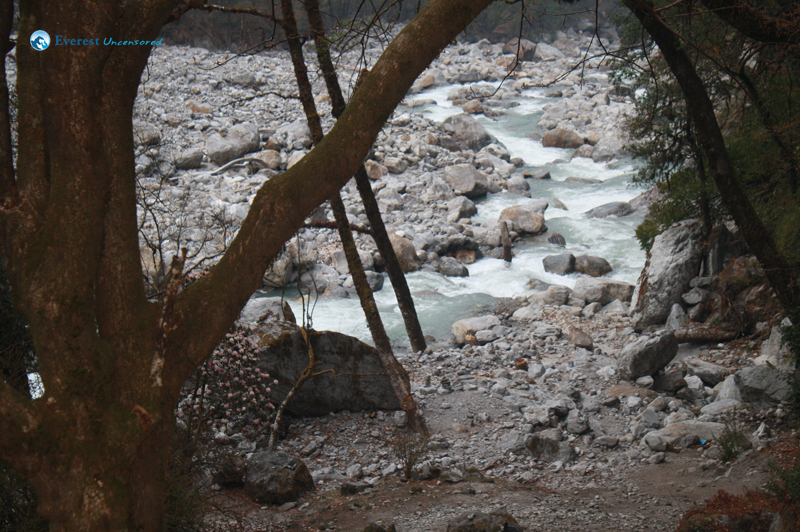 On the other side of the bridge the path appears to disappear completely. 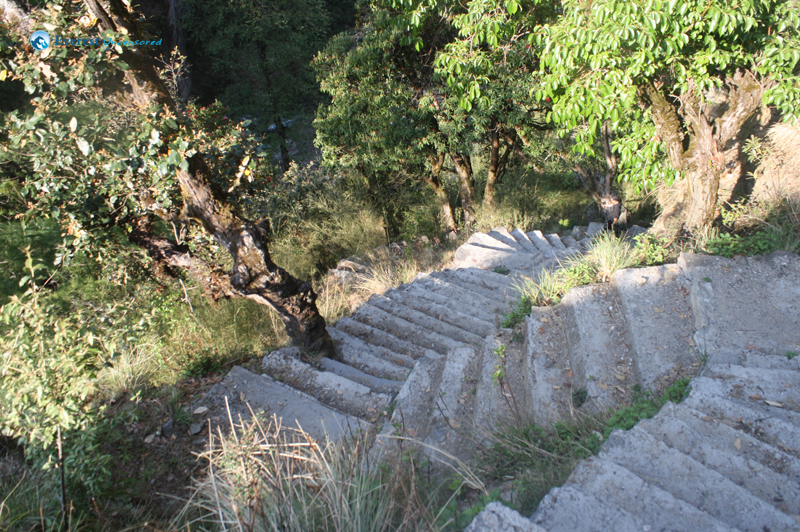 In fact, this is an optical illusion created by the body’s refusal to believe that the path continues to descend after the crossing. 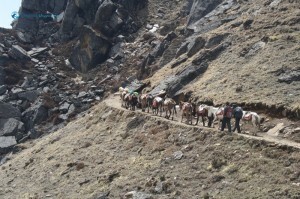 I presume it is only for lack of resources that the path does not tunnel below ground, and I am only exaggerating a little bit. 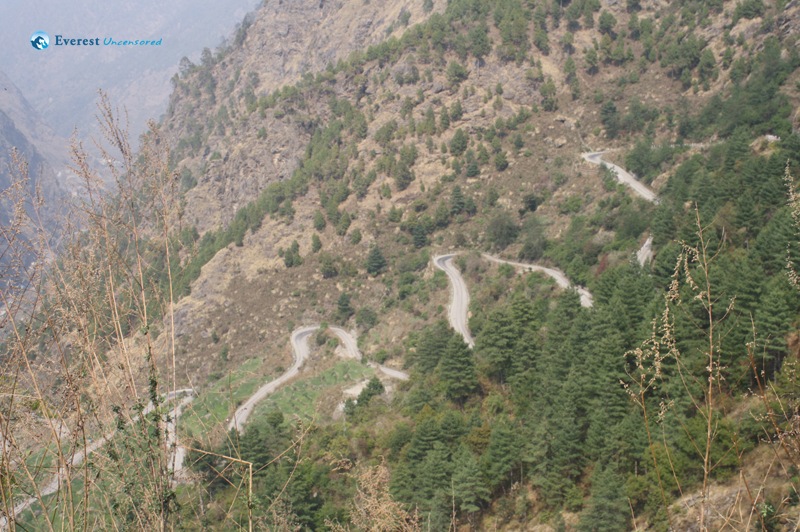 The raving lunatic who engineered this road has left nothing to chance, and instead orchestrated every detail for the further demoralization and discomfort of the traveler. 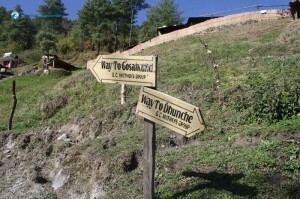 The path does eventually reach Thulo Syabru, but “eventually” is the operative word. 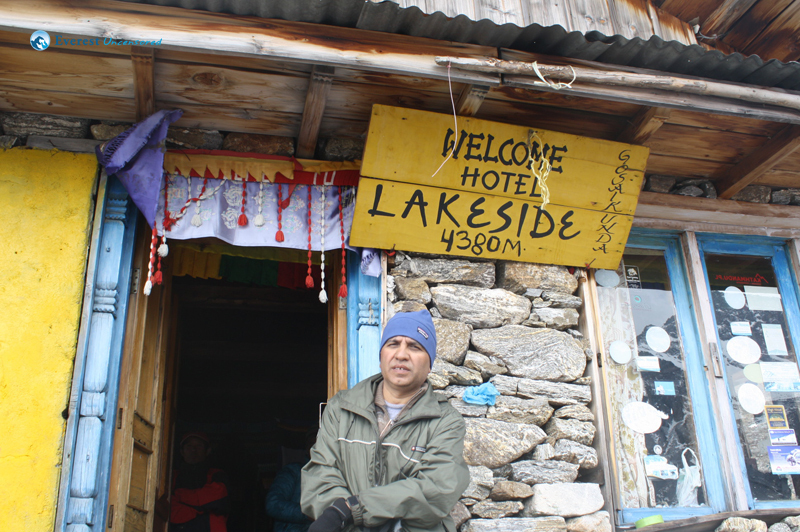 By the same token we “eventually” reached Thulo Syabru, but it was already dark and we were cold and wet and muddy and hungry and tired, and to top it all, the lodge we stayed at had no fire. 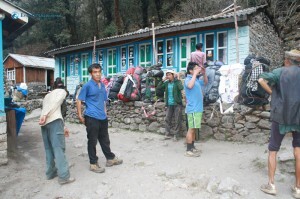 If I have any advice to trekkers in Langtang, it is this: do not attempt to reach Thulo Syabru in a thunderstorm. 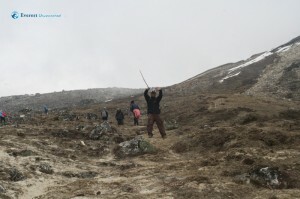 I repeat: do not attempt to reach ThuloSyabru in a thunderstorm. 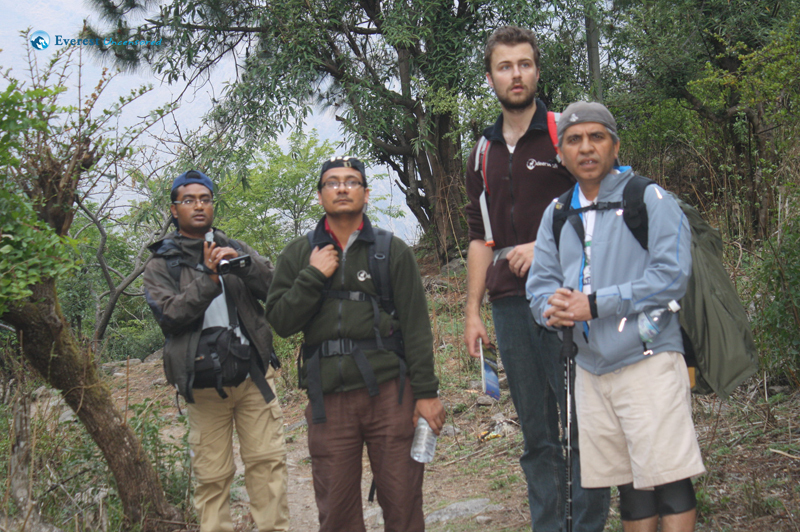 Having emphatically answered the question “how bad can it get?” over the course of the previous evening, we awoke refreshed on the morning of Day 6, secure in the knowledge that no power in heaven or on earth could turn back time and force us to trek from Pairo to Thulo Syabru again, but also in the knowledge that we did not endure hardship in vain. 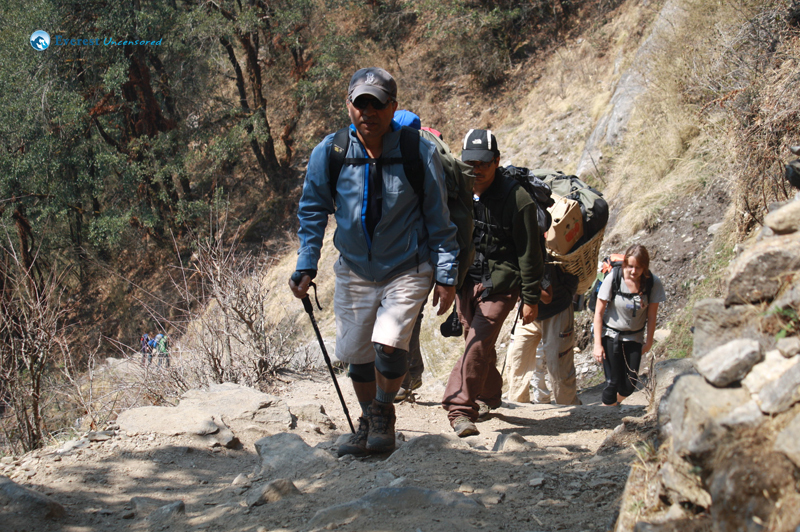 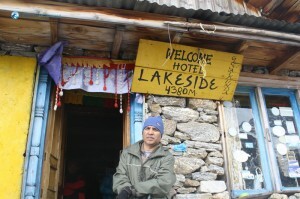 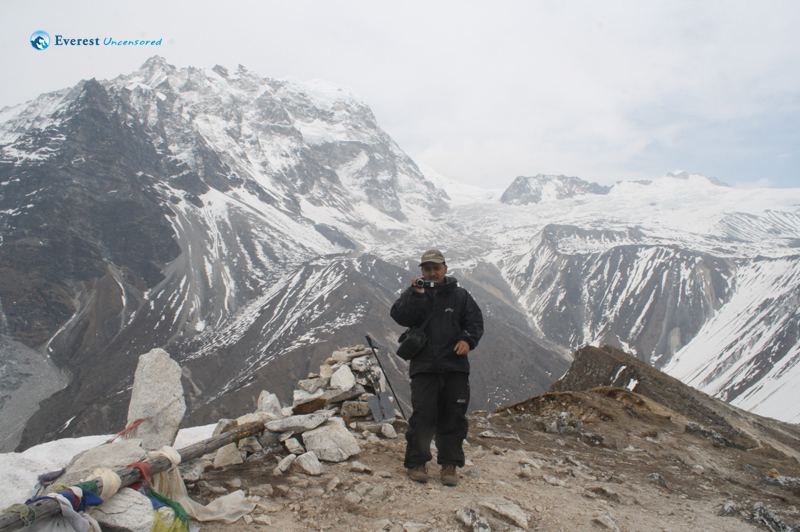 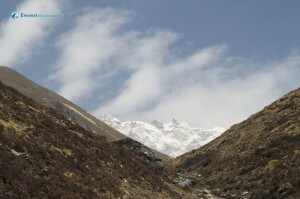 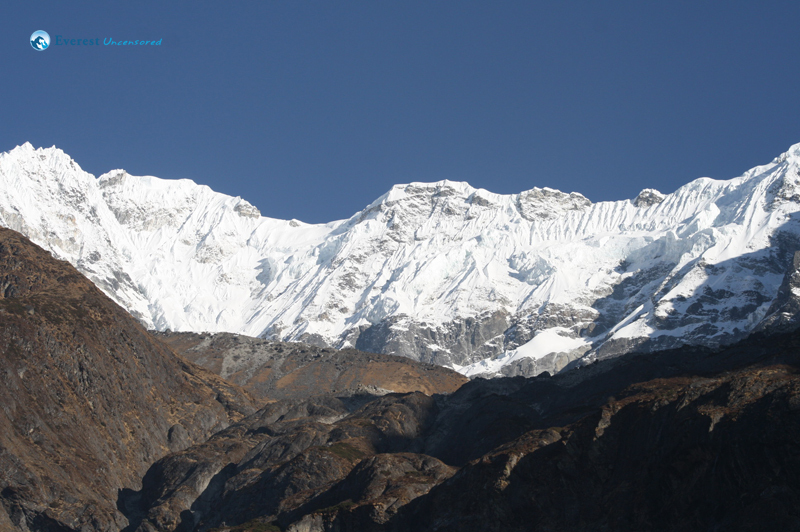 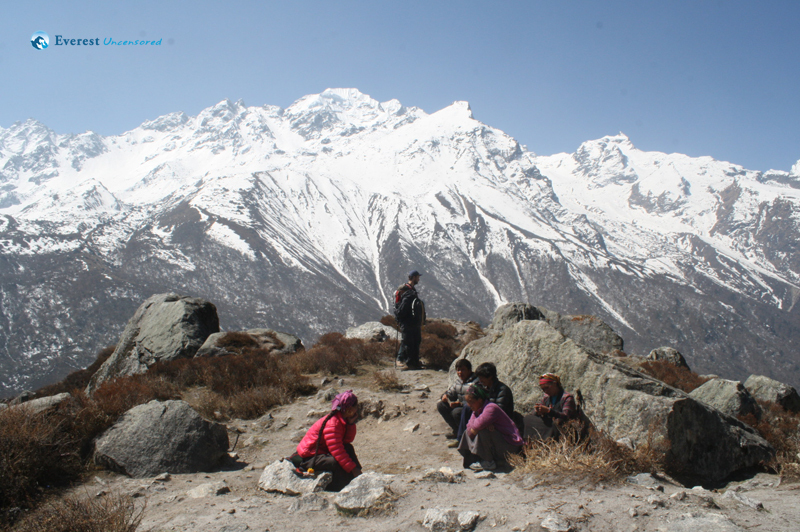 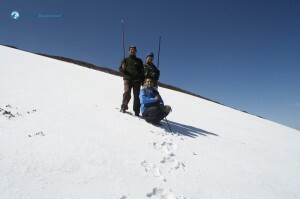 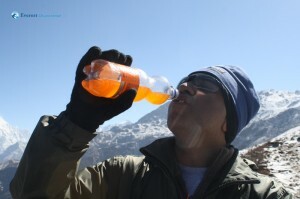 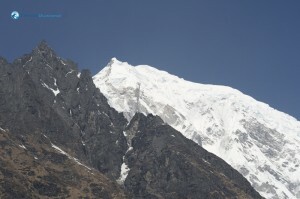 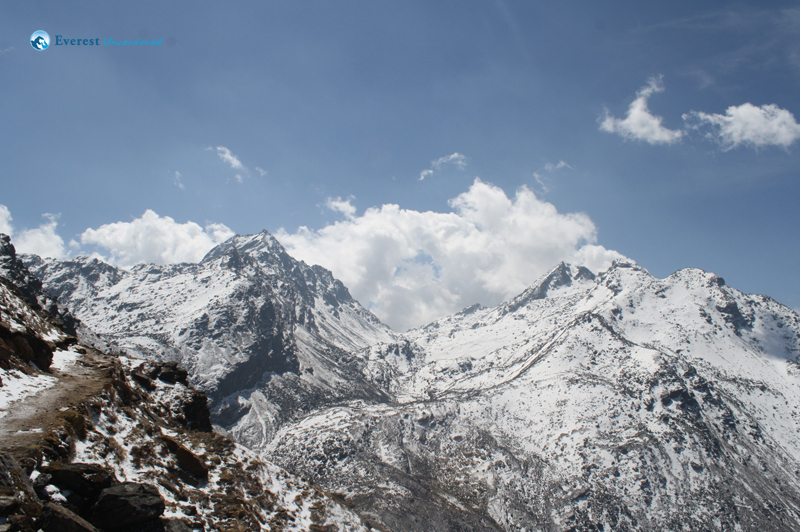 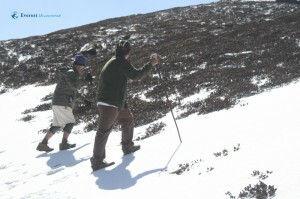 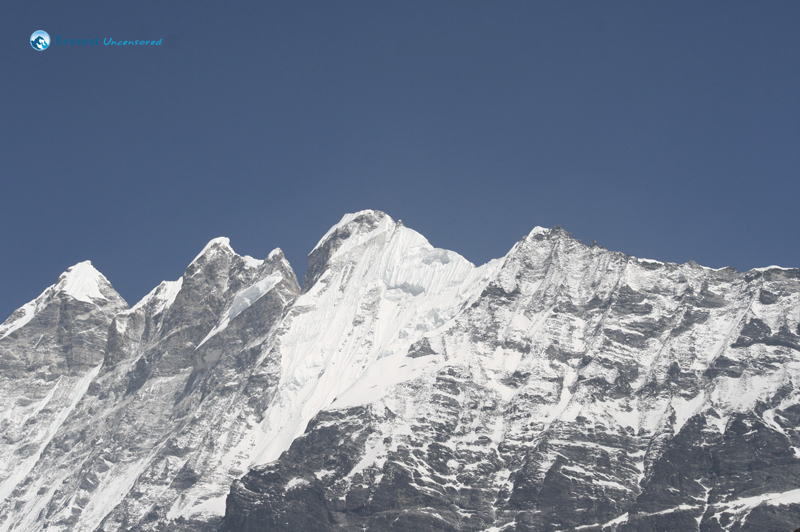 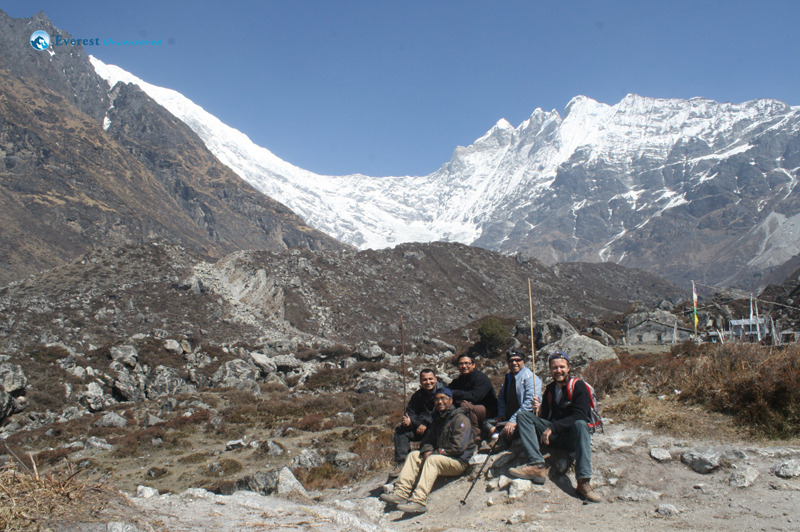 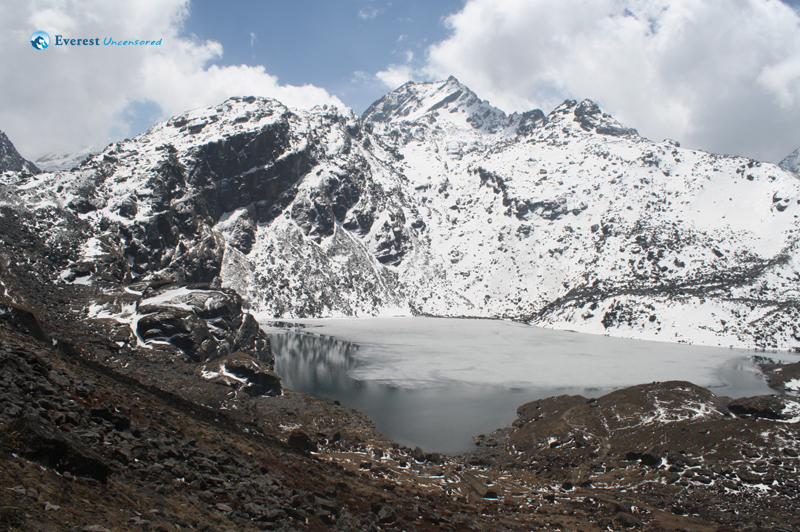 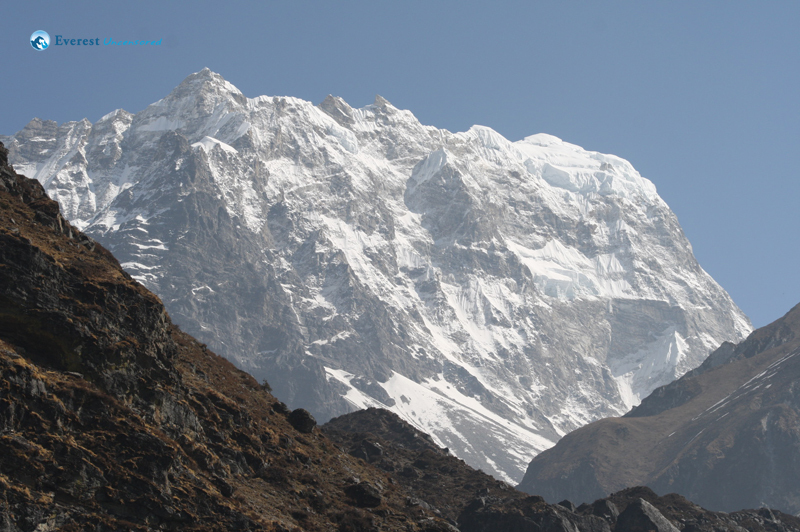 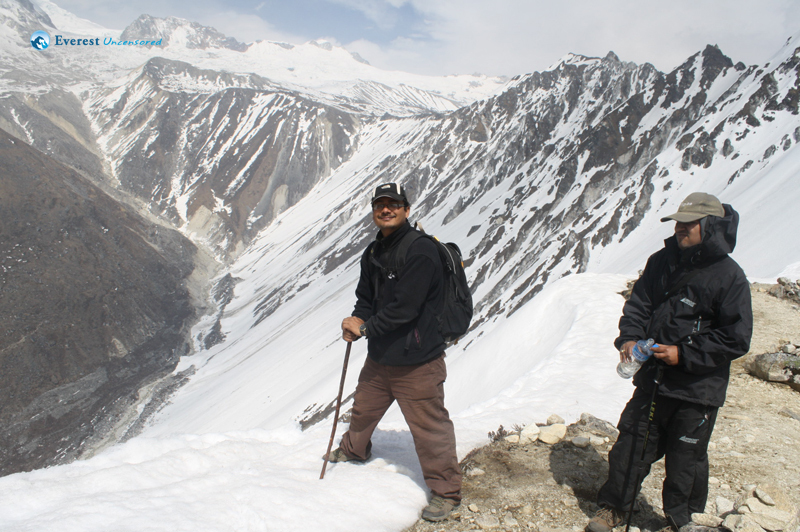 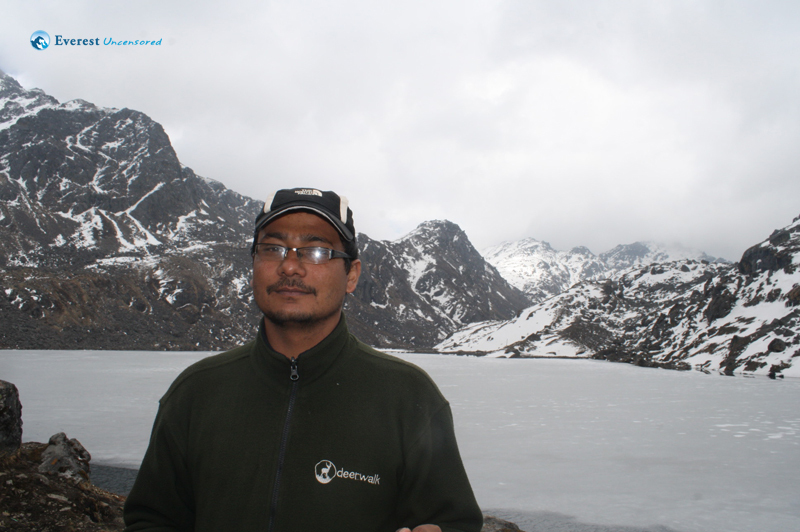 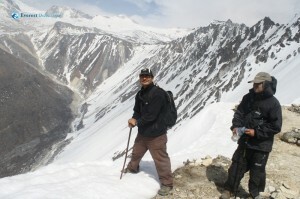 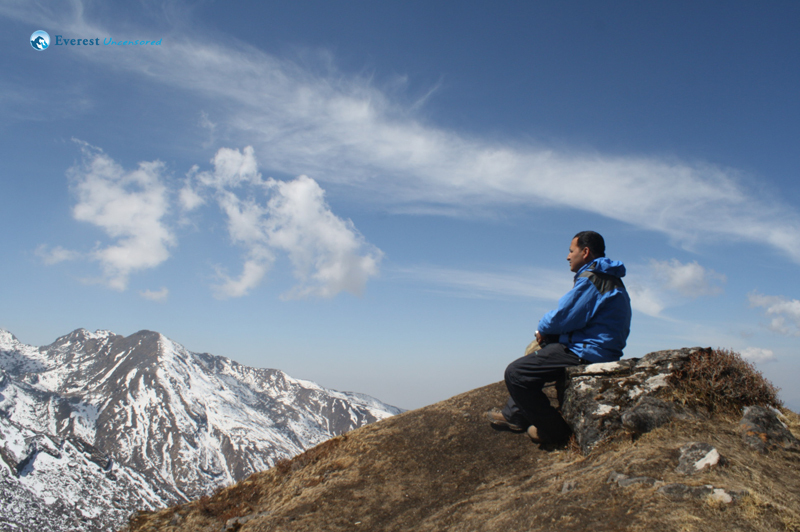 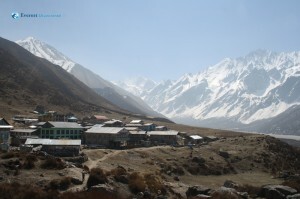 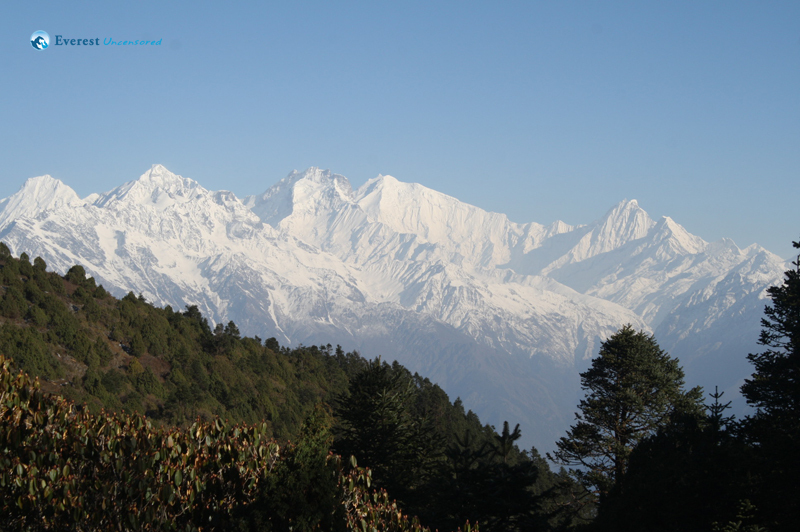 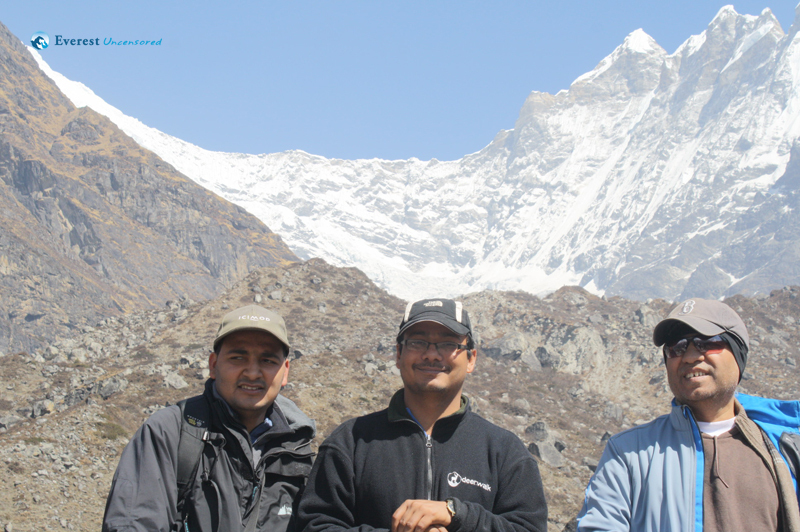 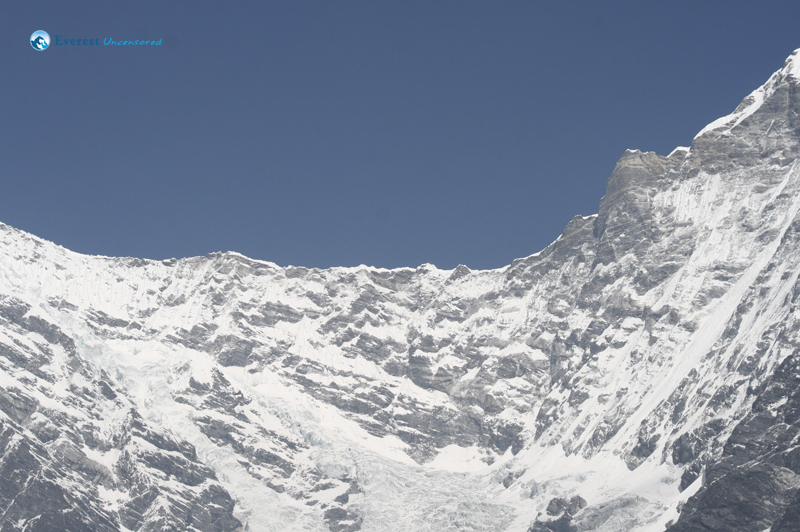 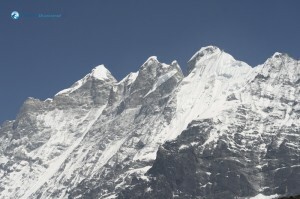 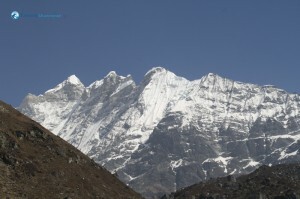 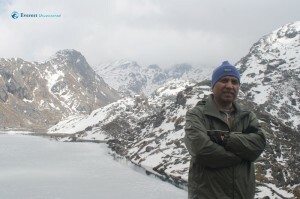 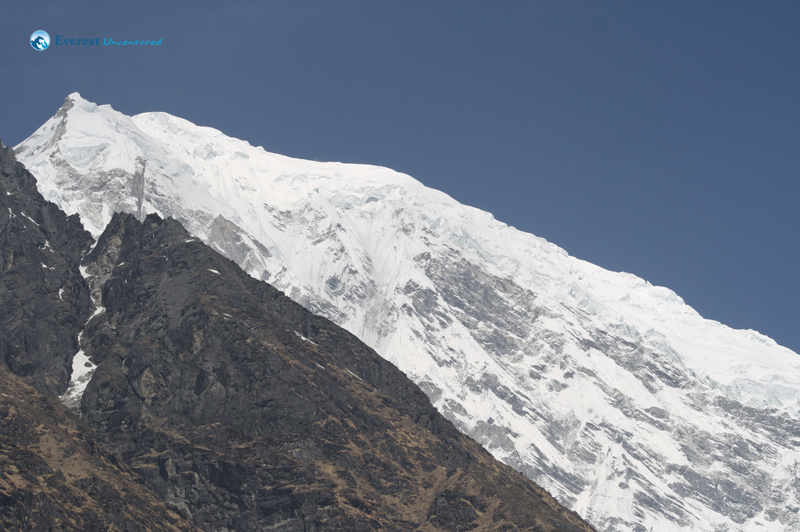 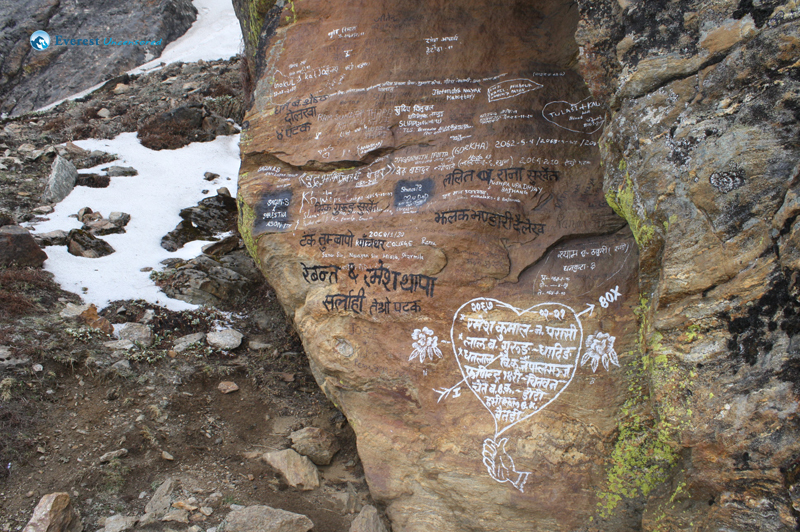 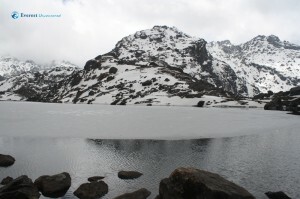 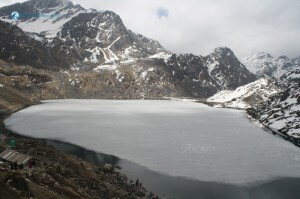 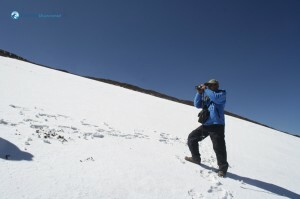 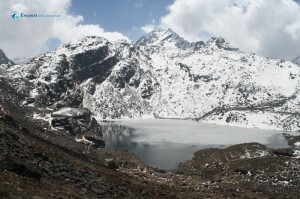 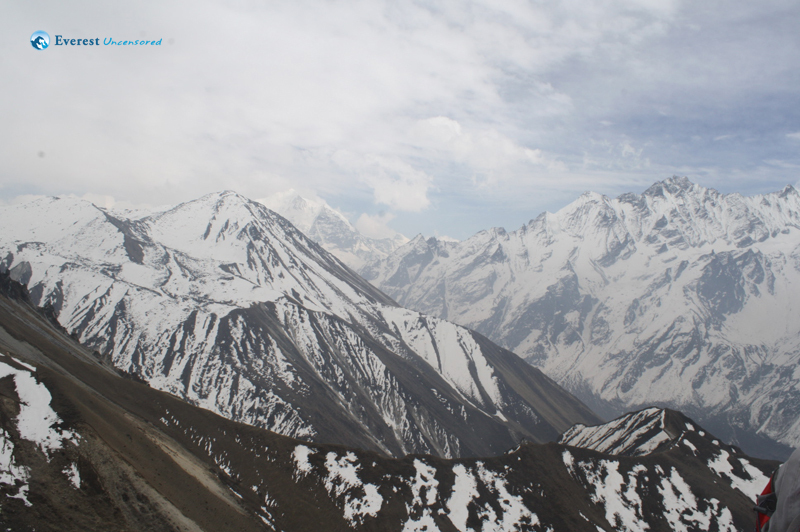 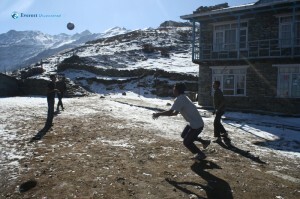 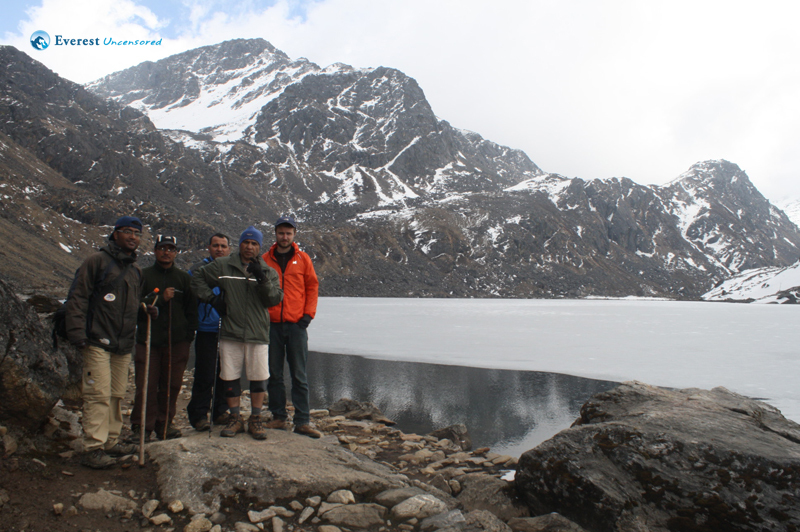 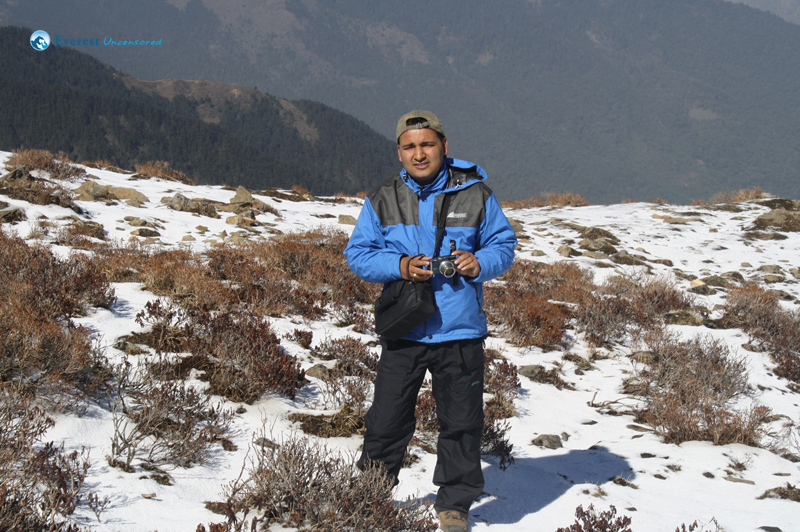 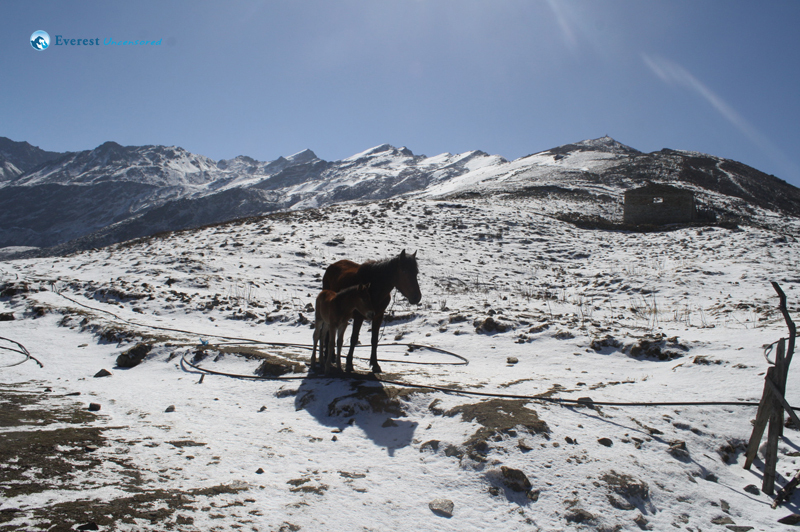 Indeed, our rapid descend from Langtang had allowed us to condense what is usually a 10-day trek to 8 days. 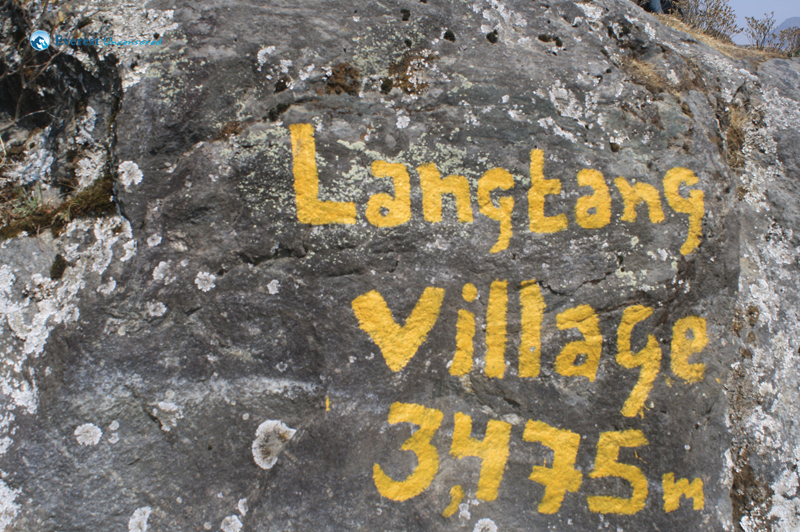 We were now in position to cross out of the Langtang Valley and continue our trek up to the sacred lake of Gosainkund, while still making it back to Kathmandu by Saturday evening in time for Nepal’s New Year celebrations. 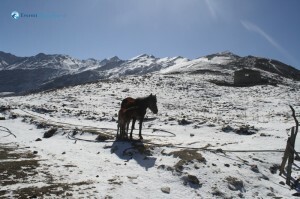 But there was work to be done in the meantime—most importantly, a 3200m ridge to cross. 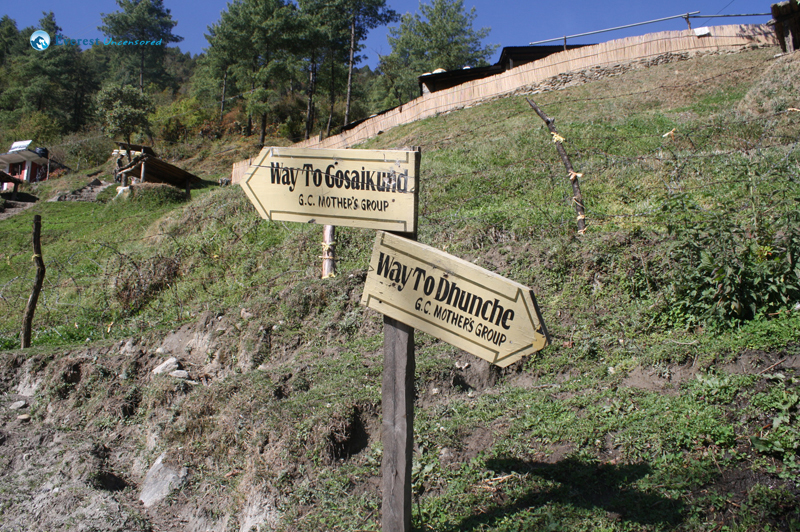 And it was on the myriad switchbacks of this 1000m climb that we occupied the entirety of our morning. 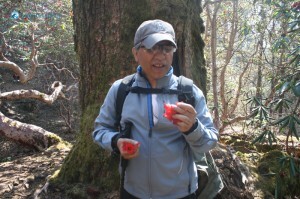 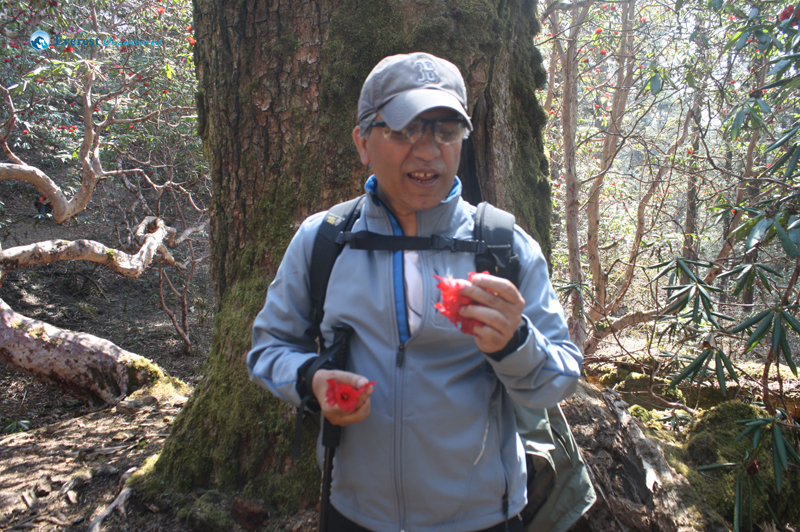 The top of the ridge housed two lodges at a place called Phoprang where we took our lunch, and the afternoon provided one of the loveliest—and easiest—walks of the whole week on level paths through a deep, silent forest of mossy evergreens and bright red rhododendrons. 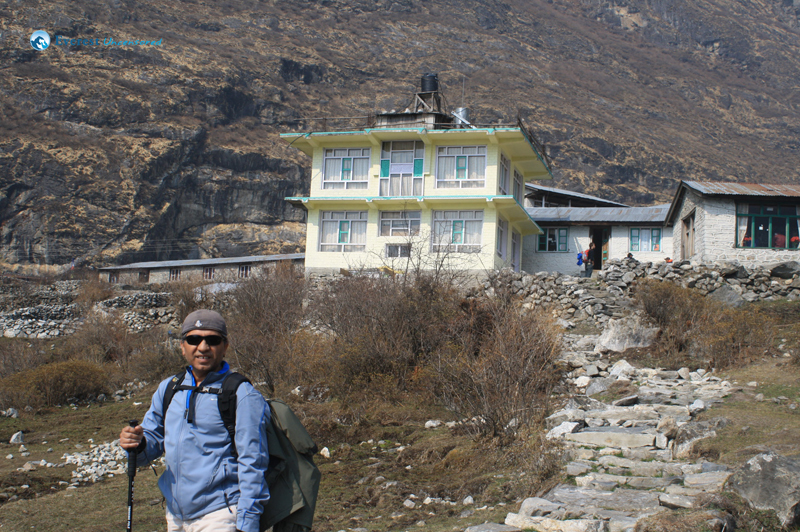 We were at our night’s lodging in Chandanbari (aka Shin Gompa) by early afternoon, and we happy for a short day after the trials of the previous night. 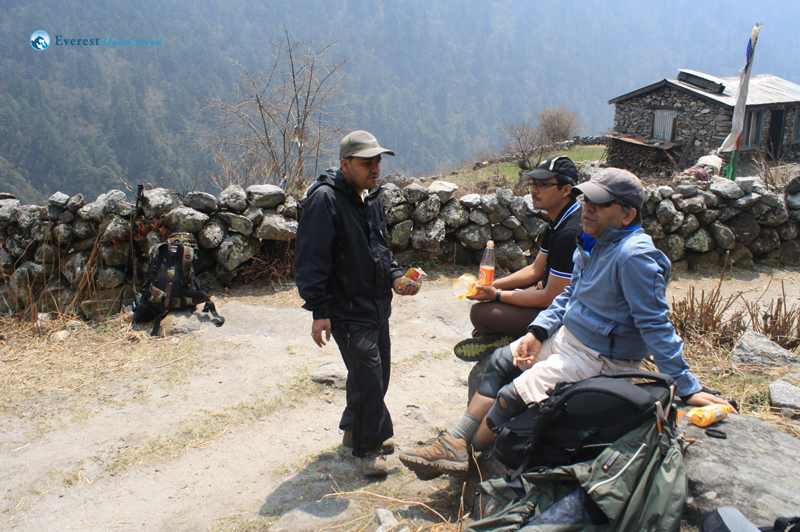 We had, at this point, grown decidedly tired of the food; this is not to say the food along the way was bad—though it was far from good—just that it was repetitive; lots of starch and lots of egg and lots of tea, but little else. So when we learned that our lodge at Chandanbari (the Sherpa Hotel, if I am not mistaken) provided travelers with the option of a little meat with their meal, we jumped at the chance. 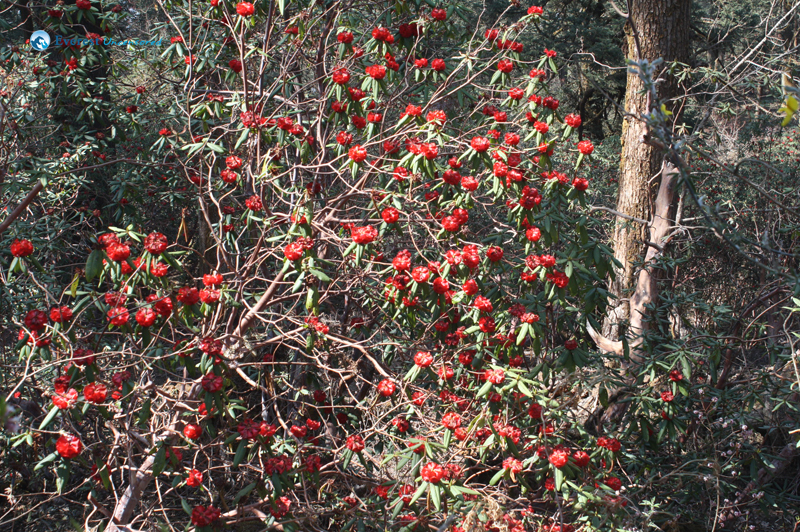 But there was a catch, and not just the exorbitant price; you’ve got to kill it first. 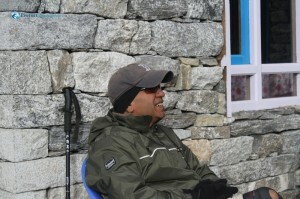 The proprietor of the Sherpa Hotel maintains a small flock of chickens. 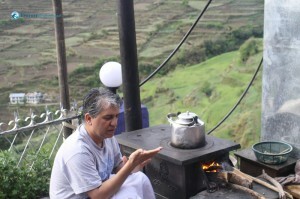 He’ll sell you one, and is more than happy to prepare it for you, but for religious reasons can’t actually kill it. 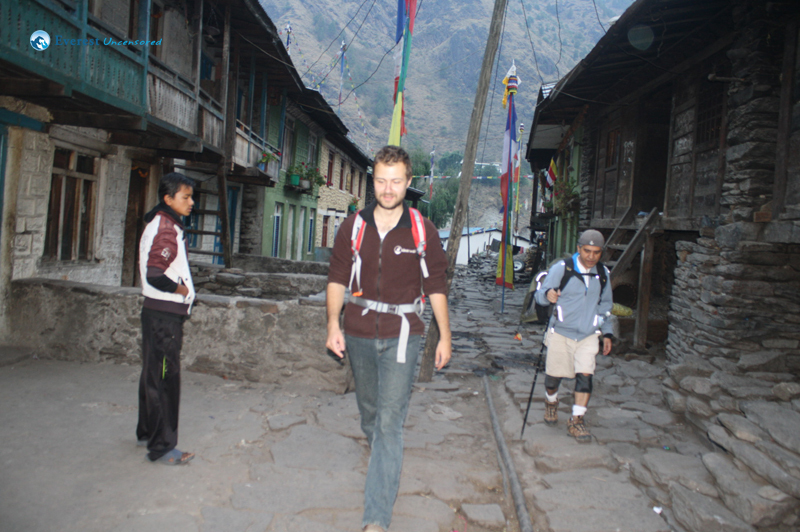 Apparently I have the look of a killer—maybe it’s the beard?—because my travelling companions immediately assumed that I would have no qualms about killing the chicken on the proprietor’s behalf.They were right; perhaps as a relic of my schoolyard days, I can never say no to a dare. So we snuck out into the backyard and I lopped up the unfortunate little fellow’s head with a khukuri, and we all ate well that night. 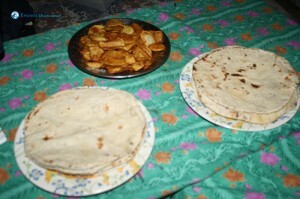 As an aside to my companions, I will say only this: “you’re welcome”. 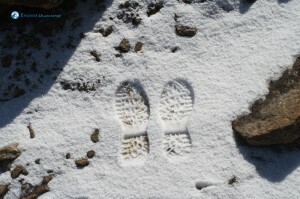 Another early morning found the five of us on the trail with flashlights well before daylight. 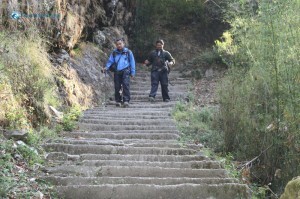 We had a lot of ascending to do. 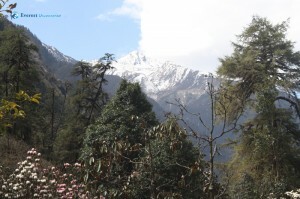 First 400m to Cholangpati, then another 300m to the lodges at Laurebina, and at least 400m more, through the morning snow that had not yet melted off, to the gompas on the peaks that loom above. 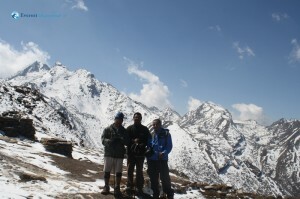 Here the views were spectacular. 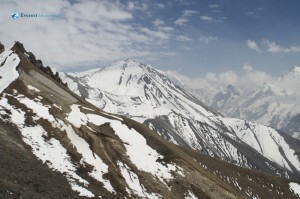 360 degrees at 4000m, Himalayan ranges in every direction as far as the eye can see. 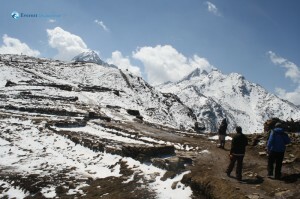 But we could not pause to admire the view for long; we were not yet at Gosainkunda. At Laurebina, the path narrows to a sliver of dirt, and continues to climb upwards. It’s a steep drop if you slip, and the melting snow makes the path quite muddy, so you’ve got to watch where you put your feet. Slowly but surely we trudged on to Gosainkund; and, by noon, we were there. 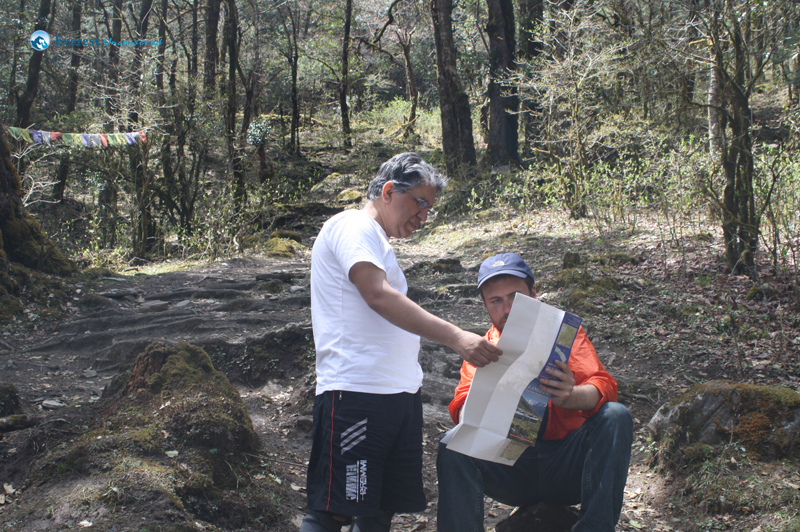 We lunched, and some of us bathed in the icy cold waters, but by 2PM we were back on the trails, retracing our steps all the way to Chandanbari. 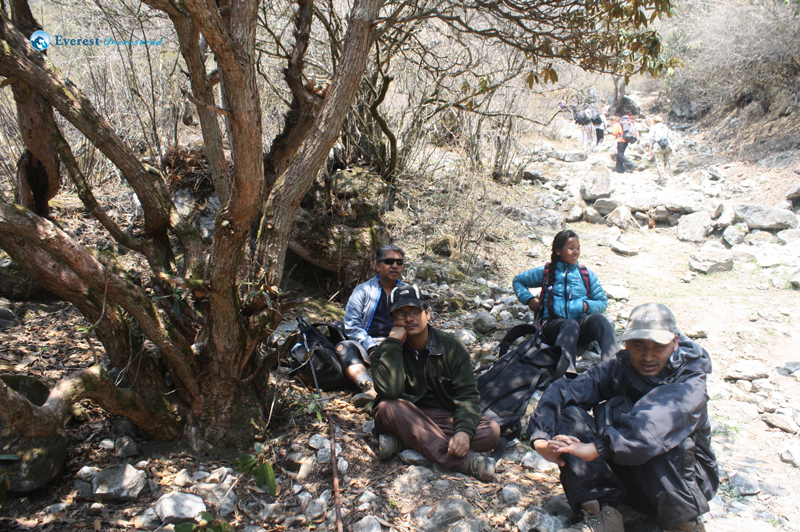 We were back around sun-down; tired but happy. Fittingly, our last day on the trek started in the early morning. 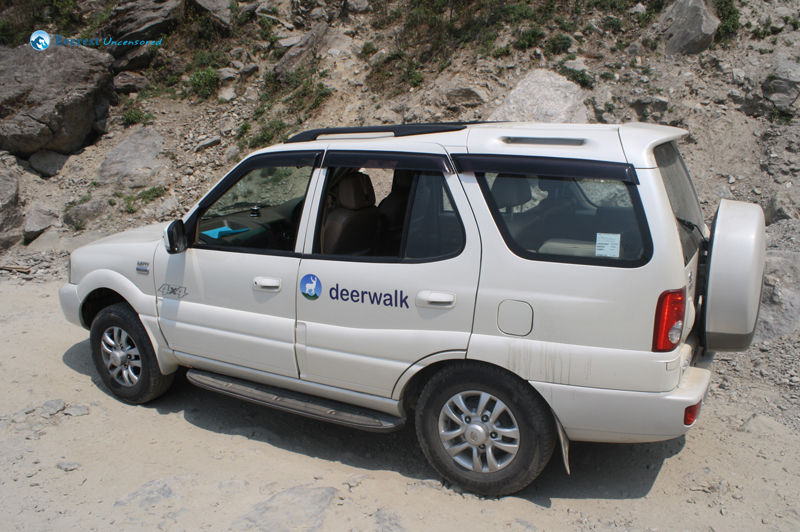 We were meeting Ram and the Deerwalk Jeep in Dunche at 10AM, but it was a long way to there from Chandanbari. 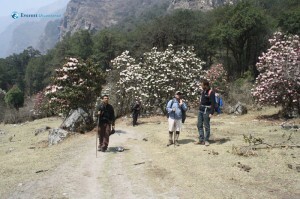 Thankfully it was nearly all downhill, and the scenery was extraordinary. 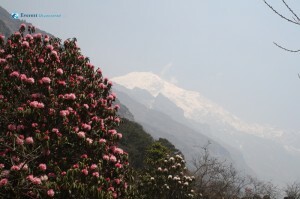 The jungles we passed through on this final day’s descent were possibly the most pristine of the entire journey, brimming with birds and wildlife. 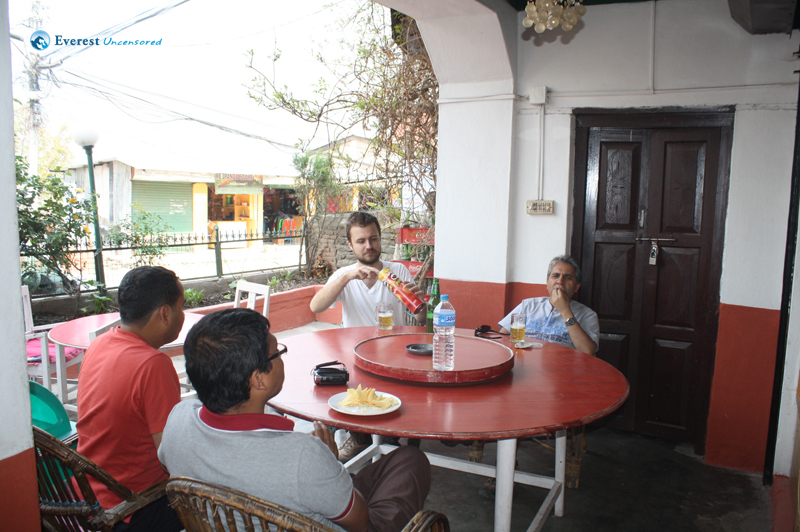 At Dunche we indulged in a bit of civilization, with masu-chuira and beer, before hopping in the jeep for the long drive back to Kathmandu, and a return—at once welcome and unwelcome—to our regular lives.